What have you been learning about lately? How have you been learning about it? What do you plan to learn about next? When I’m having these conversations, it’s often responses to the second question that stick with me and get me thinking about different types of resources, how they support different purposes and where they fit along the journey of a life long teacher-learner. Based on my own reflections and perspectives, I created Taryn’s Taxonomy of Professional Learning Resources to illustrate my beliefs about the many different sources teachers use for their professional learning. 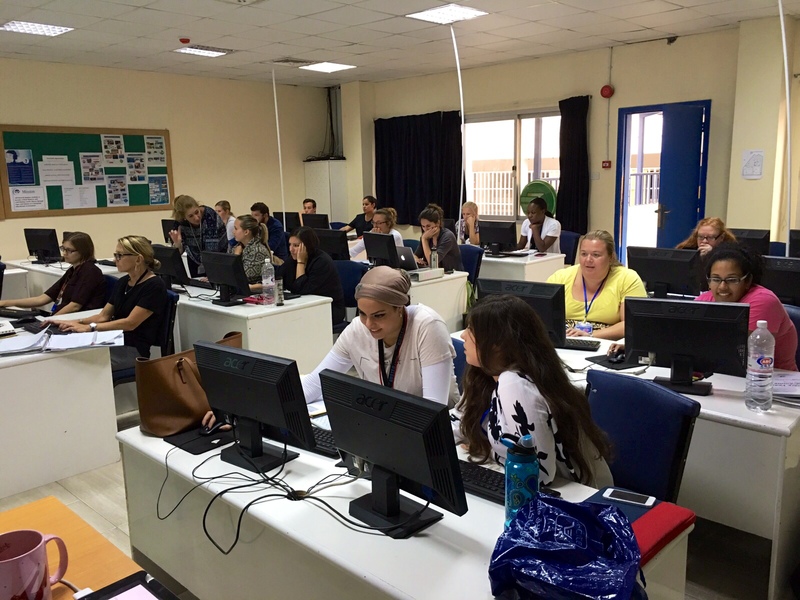 Teachers Pay Teachers – I can understand why teachers use TPT. I pass no judgement on teachers who uses TPT. However I don’t like TPT for a variety of reasons, many of which are shared by fellow educators Matt Gomez and Chelsea Bashore. 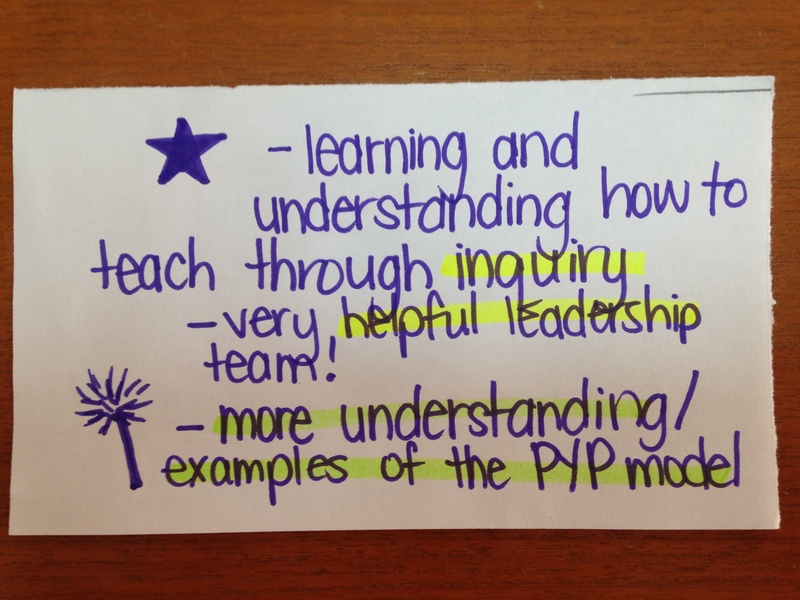 For these reasons, I believe that TPT is on the lower end of the taxonomy of professional learning resources. 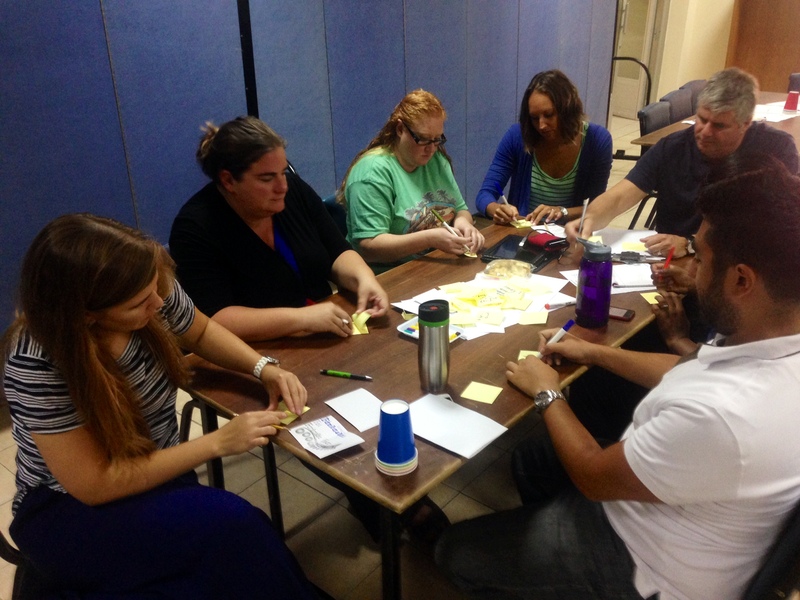 I think TPT provides teachers with things teachers can use right away in their classroom, but like Edna Sackson says, “effective professional learning is not about things you can try tomorrow, but rather big ideas that shift your understanding of teaching and learning”. I’ve yet to see TPT as source of big ideas that shift teachers’ thinking and until it does, it will remain on the bottom of my taxonomy. Pinterest – I’ve shared my opinions about Pinterest before. So have other educators. I think similar to Teachers Pay Teaches, time spent on Pinterest is most often focused on the “what” of teaching, not necessarily the “how” or “why”. Focusing on the “what” keeps us in the cycle of doing school and prevents us from moving closer towards real learning. Many teacher-friends have been telling me that Pinterest has gotten better lately – for this reason I have placed it above TPT- but I still have my reservations. Until the comments shift from “I saw something on Pinterest I am going to try” to “I learned something on Pinterest that blew my mind and totally challenged my thinking about _____” it will remain on the lower end of my taxonomy. 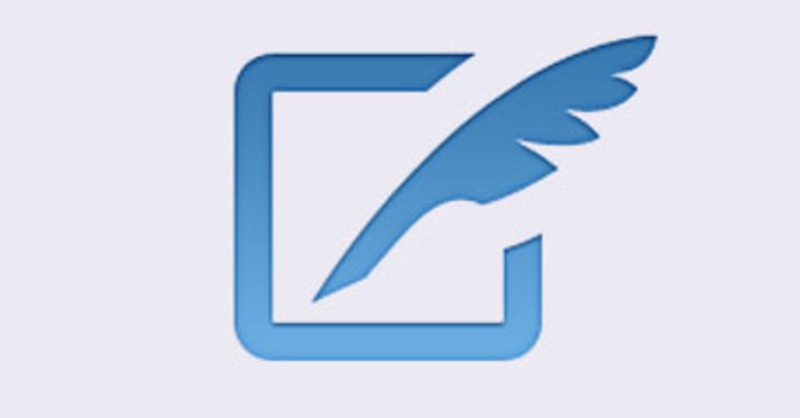 Blogs – Blogs. Now we’re getting somewhere! True, some blogs can still be stuck in the “what”, but good blogs start to move into the “hows” and “whys” of teaching and learning. 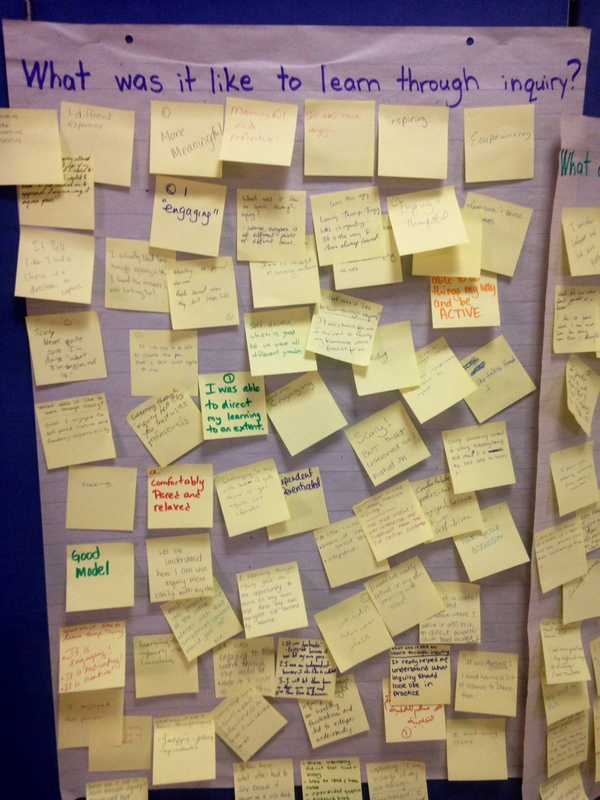 Blogs allow teachers to share their practice, thoughts, questions and reflections. This reflective, narrative quality is what opens up the conversation to allow for the exploration of how to turn theory into practice and why something is worth knowing or doing in the first place. Really excellent blogs even go so far as to critically look at teaching and learning, ask provocative questions and challenge your thinking about why we do what we do – and why we need to do it better! However, something to be cautious of, is the fact that anyone can blog, which means much of what is written is coming from one person’s experience and perspective (like this post for example!) so you have to be discerning and critical as a blog consumer. Twitter – Twitter is in a very similar category to blogs for a few reasons. First of all, on Twitter you can find “whats”, “hows” and “whys”. However, the benefit of Twitter is that you are exposed to a wide range of everything all at once so you can easily skip past the “whats” in search of the “hows” and the “whys”. Also – similar to blogs – you also have to be a critical consumer when reading people’s perspectives and opinions about teaching and learning. Yet, even though Twitter is a forum where personal perspectives are shared, research is also discussed and cited quite regularly. Edna Sackson advocates for professional learning that challenges our thinking by providing us with tensions to work through and big ideas to connect. In my opinion, Twitter as a resource successfully accomplishes that very goal! 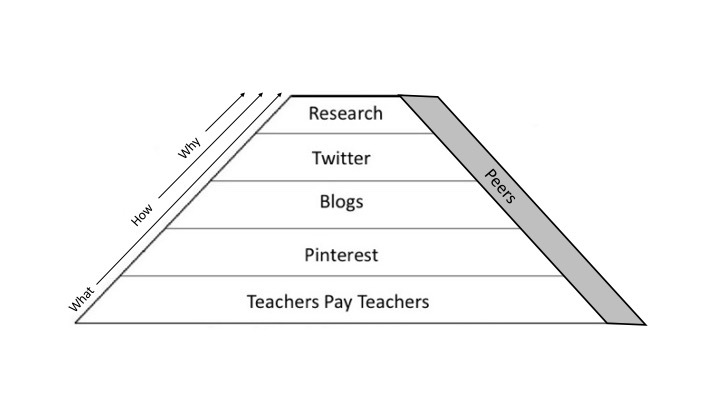 Research – Education research… the highest level on the taxonomy… the apex of the pyramid… and sadly, the most seldom used source of teachers’ professional learning (present company included!). Sources like ERIC, ASCD and Google Scholar provide access to thousands of journal articles that provide strategies for teaching and learning that are supported by data. 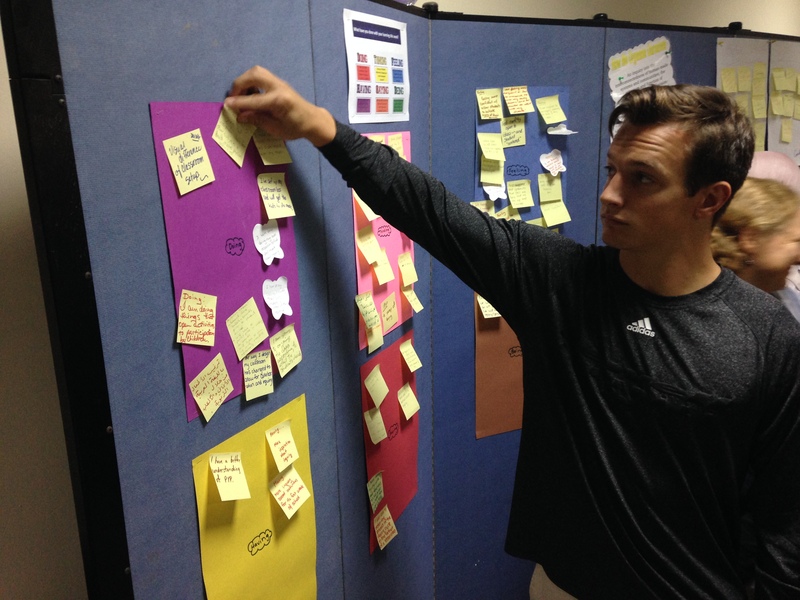 Education research can provide answers to our questions about the “what”, “how” and “why” in research-based ways. It’s not one educator’s opinion about what they think is effective in the classroom, it’s what has been shown to be effective through rigorous research design, large amounts of data collection and sophisticated analysis and interpretation. The question is, if all of this amazing, data-supported education research is available… why aren’t more of us using it in our professional learning? 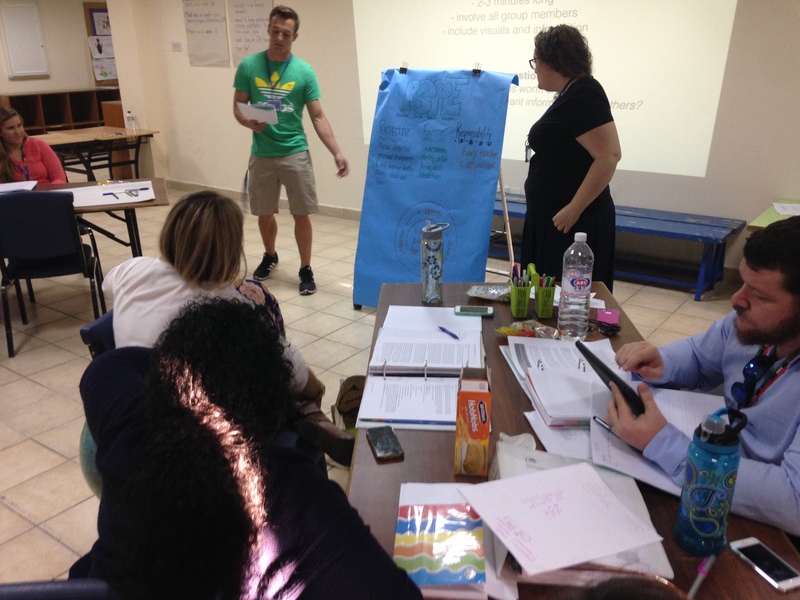 Peers – I have placed peers as a resource for professional learning all the way up the pyramid. 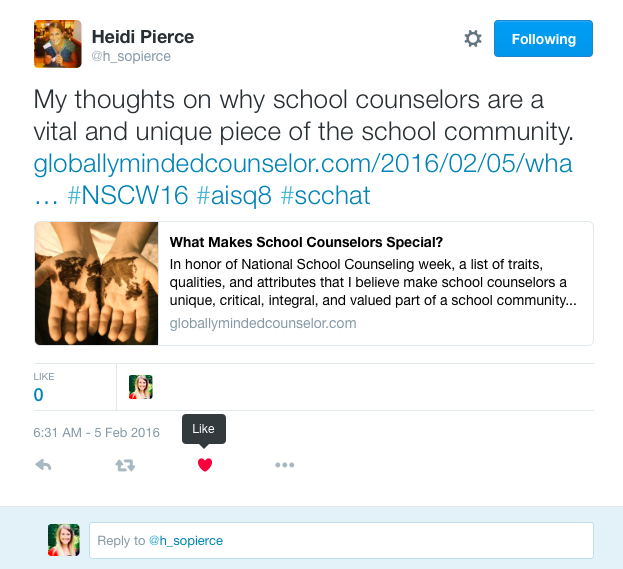 This is because I believe peers can be an amazing source of professional learning – depending on what is being shared. Peers can be an avenue for sharing everything from a “what” found on TPT all the way up to research-supported “hows” or “whys”. When I think back on my own journey as a learner, I can see how I have moved up the taxonomy over the years- starting from focusing on the “what” and year by year getting closer to focusing on the “why”. I was never much a TPT user, but I was definitely a Pinterest addict and spent my early years in education looking for things I could use in my classroom. Last year I got into blogs to support my inquiries that were more focused on learning about how teachers made inquiry-based, concept-driven education a reality for their students. This year I am all about Twitter. I love scrolling through and having my own beliefs about teaching and learning challenged and learning about new ideas and initiatives that help me move away from “doing school” and closer to being able to facilitate true learning. I can clearly see where I need to head next…. in to the scary land of education research. That will be my focus for next year. 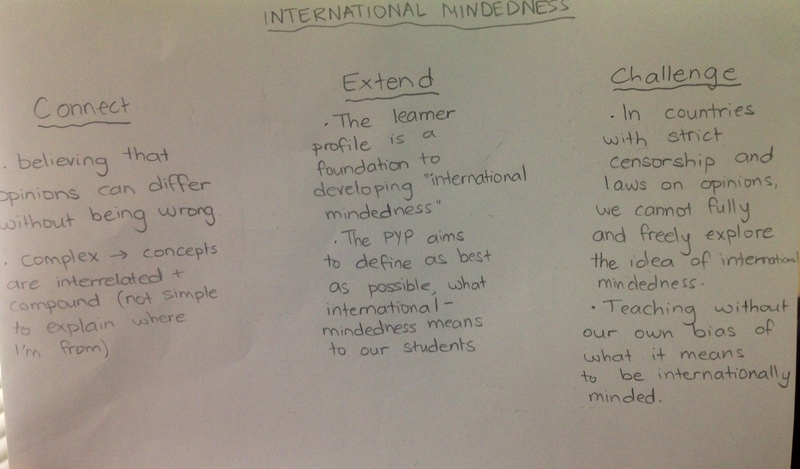 When thinking about this taxonomy and my role as PYP Coordinator, I am beginning to think that my job is not only to support teachers’ learning… but also to support teachers as learners by helping them move up the pyramid to use sources in their professional learning that are grounded in research and focus on big conceptual shifts in thinking. Where are you on the taxonomy? 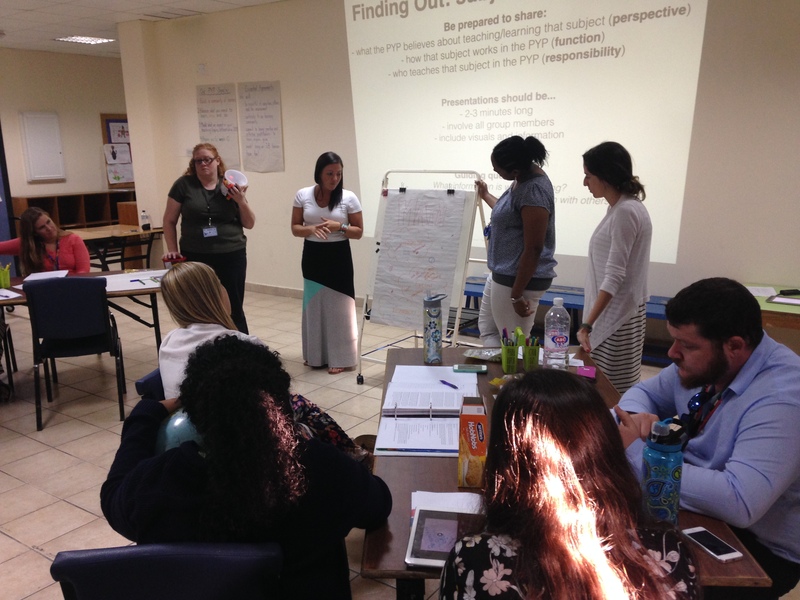 What are your perspectives on the different sources of professional learning? 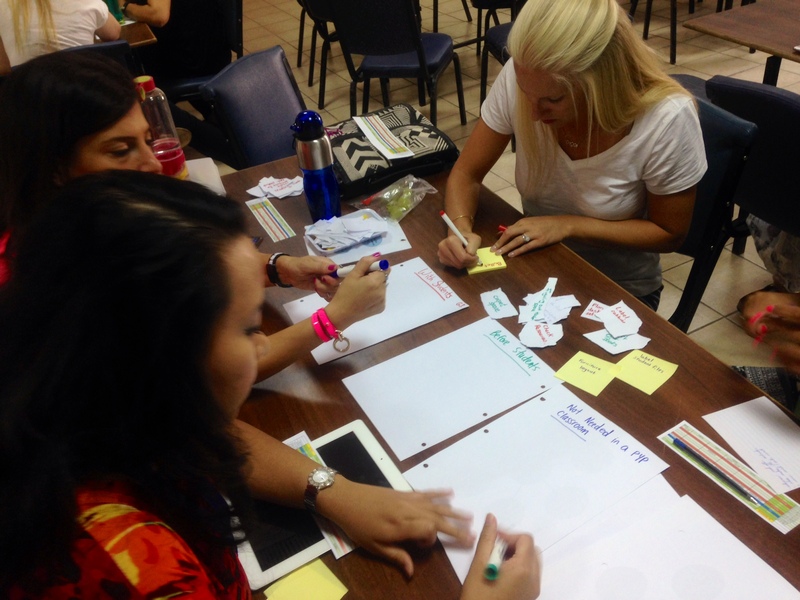 What sources of professional learning am I missing? Where would you place them? How do you help your colleagues move up the pyramid? 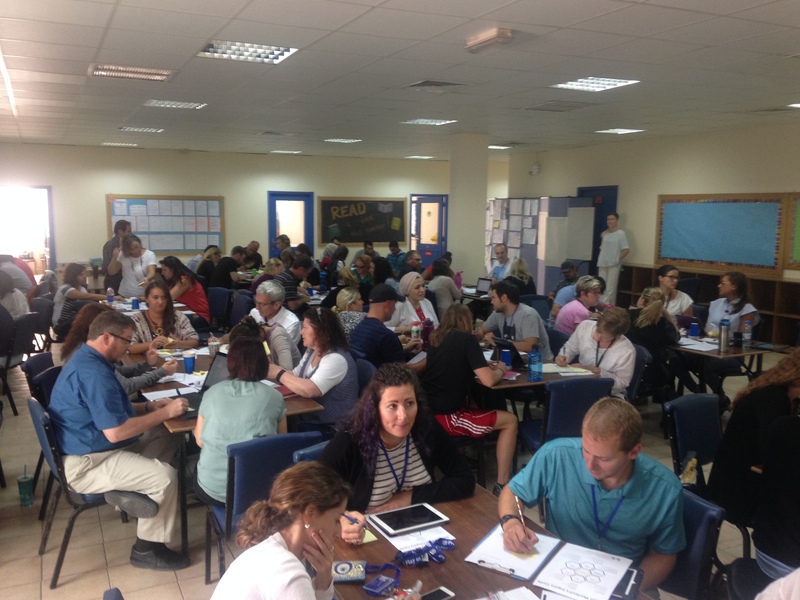 During our half day of Personalized Professional Learning, I hosted a workshop on inquiry-based math strategies, but not everyone who wanted to attend could attend… so I thought I’d recap the workshop here for those of you who could not make it – and for those of you at different schools who might be interested in this topic as well. The structure of the workshop was very hands on, so in the absence of you being able to actually engage with the materials and manipulatives, I will provide a combination of notes, photos, questions and reflections that will hopefully allow you to engage in some of the same ideas, just in a different way. Tuning in – What do already know? If you have a thorough understanding of each of these strategies, you probably do not need to read on. If you think your current understanding has room to grow, read on! I’ve already written a post about open-ended math centers and how they work in our early years classrooms. 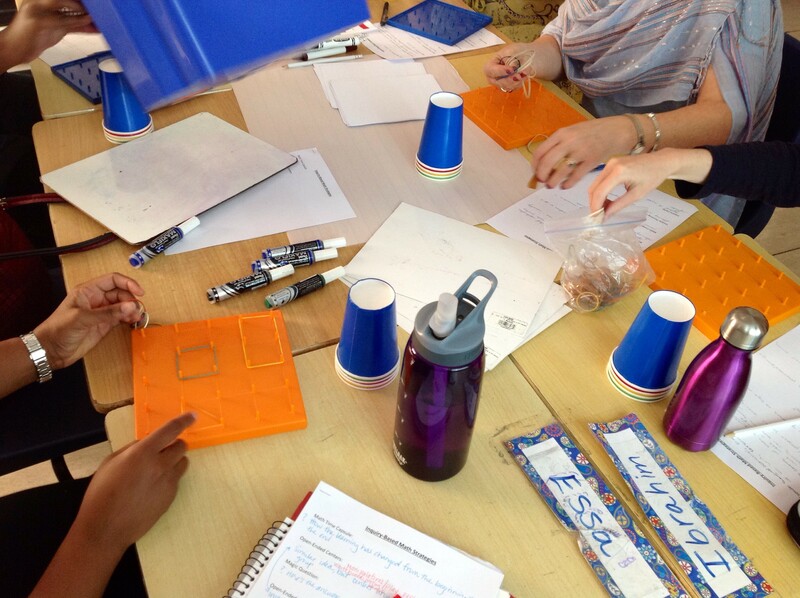 During the workshop today, each group had a bin with the three essential ingredients of an open-ended math center: manipulatives, writing utensils, and a placemat/whiteboard. 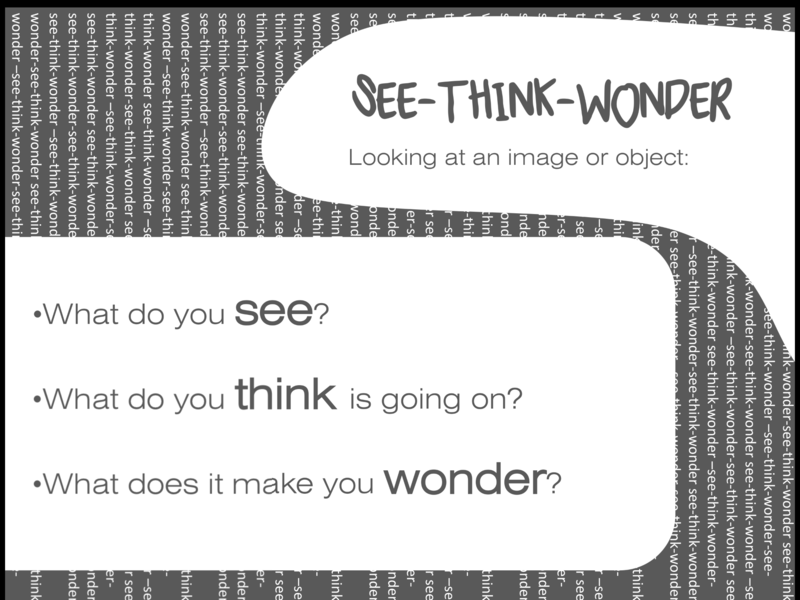 I’ve also written about my favourite inquiry question – What do you notice? In the workshop we looked at how this question can be used for math specifically. Take a look at this multiplication chart. What do YOU notice? What is the same as a half? 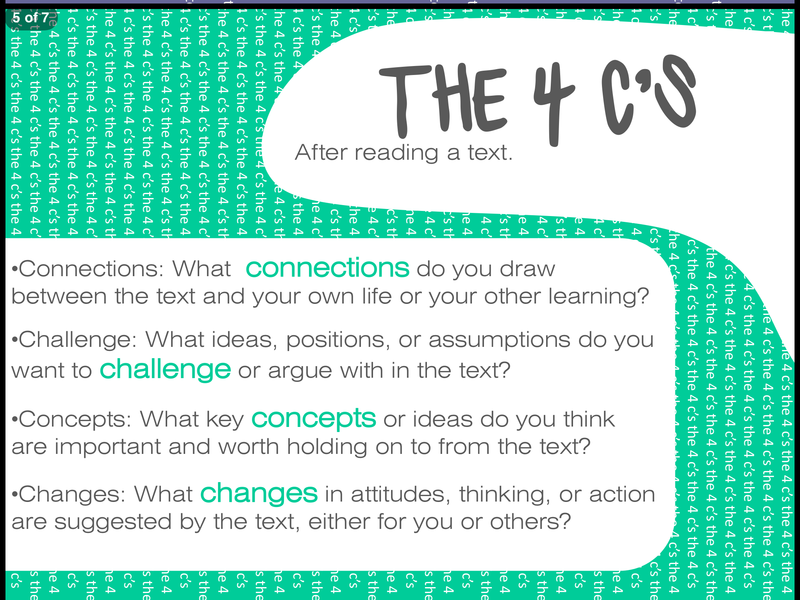 Reflect on the difference between answering the first and second question. 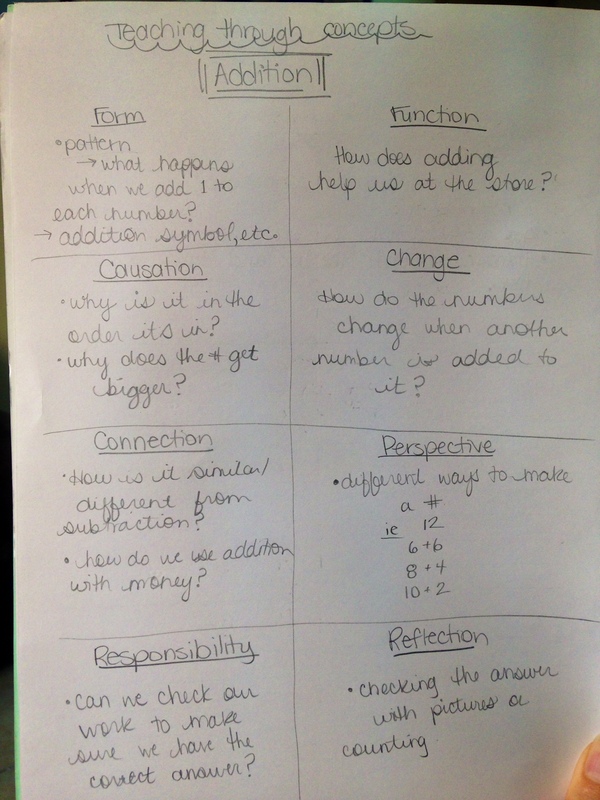 What are the benefits of asking open-questions in math? Take a look at the following image. How many dots are there? How did YOU figure it out? 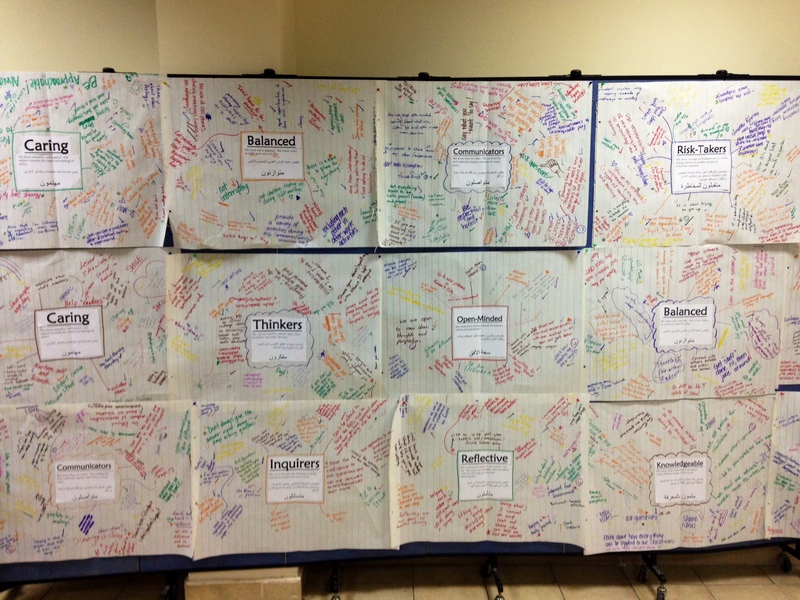 Here is a picture of all the different ways the participants of the workshop figured it out. Step 1 – Present the problem: A sports store has a number of bicycles and tricycles. There are 60 wheels in total. How many of each kind of bike could there be? Step 2 – Work towards solving the problem. Markers and chart paper work best! 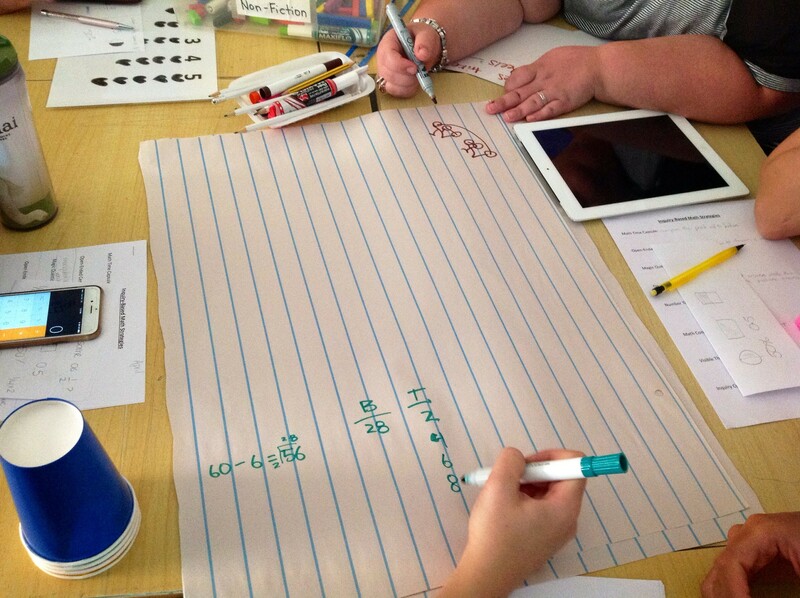 Step 3 – Share discoveries and strategies with fellow mathematicians. 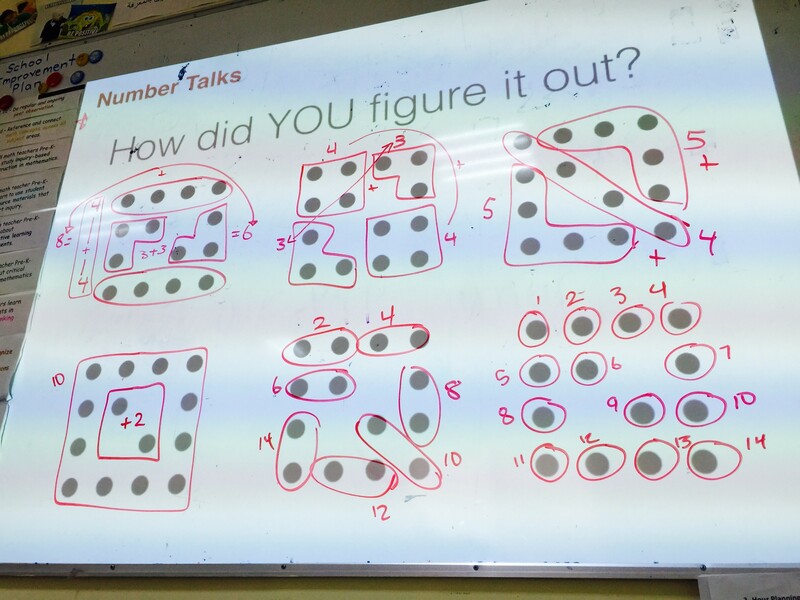 Make sure fellow mathematicians are invited to ask questions, make connections, comments and conjectures! 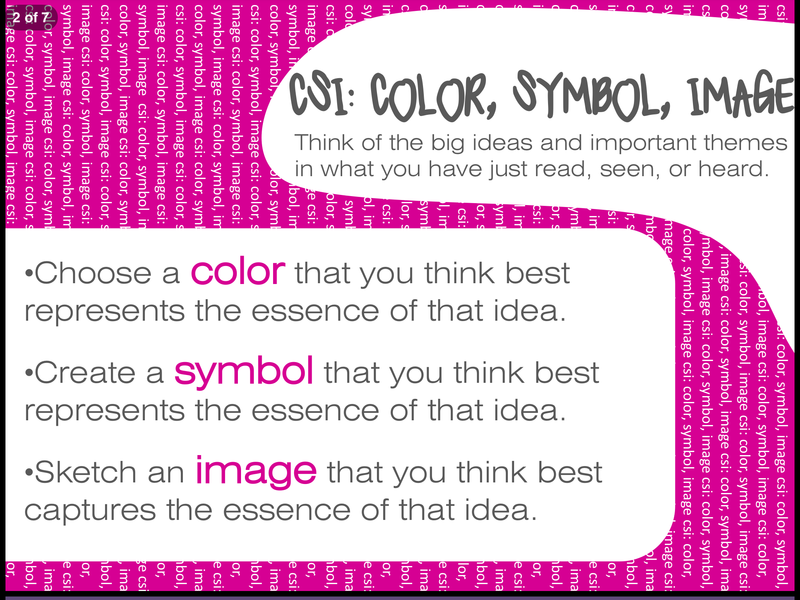 Use the Visible Thinking Routine “Claim, Support, Question” to share some of your thinking about decimals. 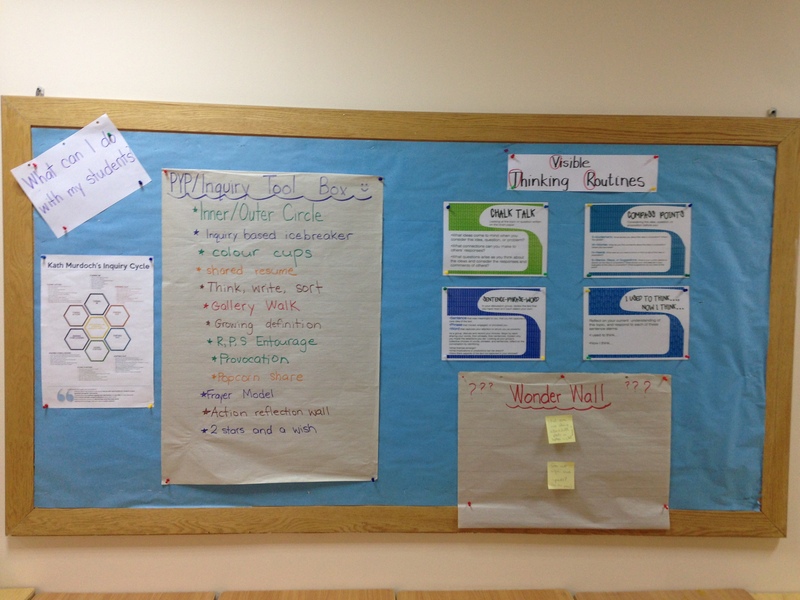 There are also many other Visible Thinking Routines that are helpful in approaching math in an inquiry based way! 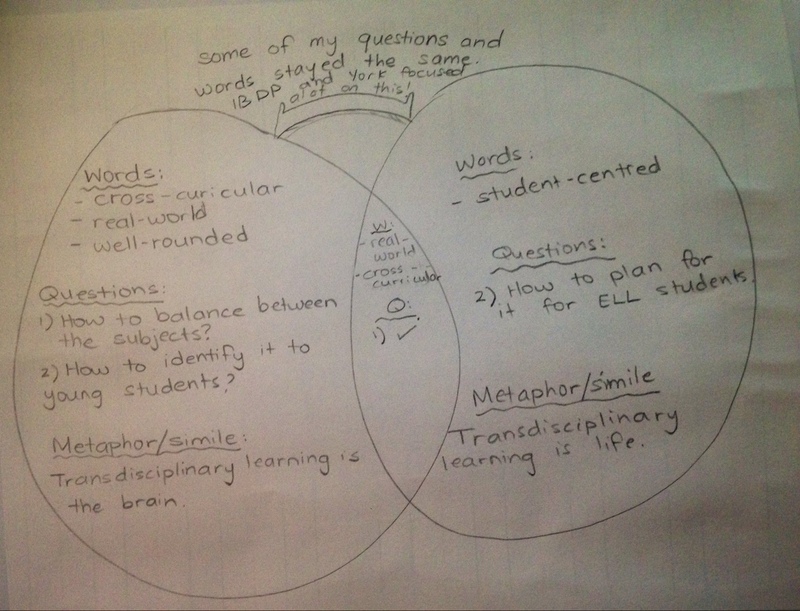 Kath Murdoch’s inquiry cycle is a great way to make any math more inquiry-based. A CCSS math standard: Know and apply the properties of integer exponents to generate equivalent numerical expressions. What do YOU already know about this? What do YOU need to find out about this? How could YOU find out about this? 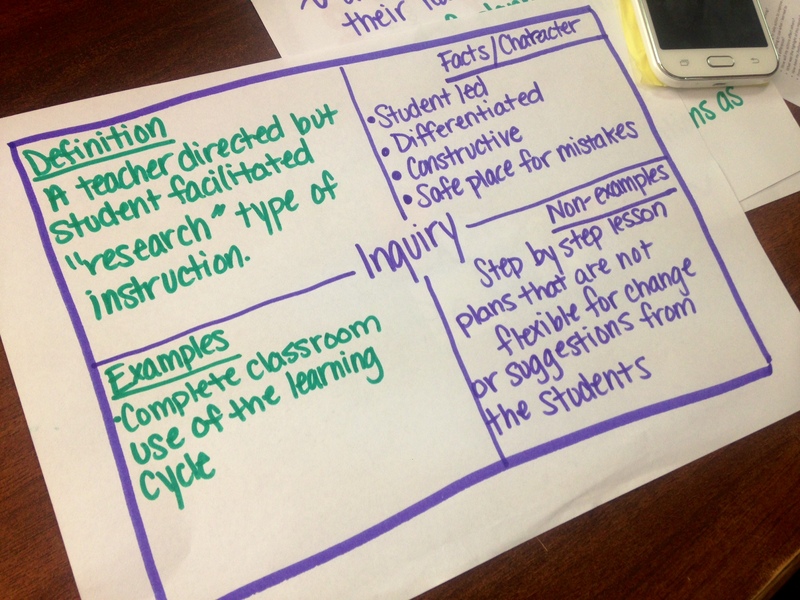 Now, think about or jot down your understanding of each of the inquiry-based math strategies listed below. A math time capsule is a great way to show growth and progress in math – whether it’s over the course of a unit, a year… or even of the course of a workshop! 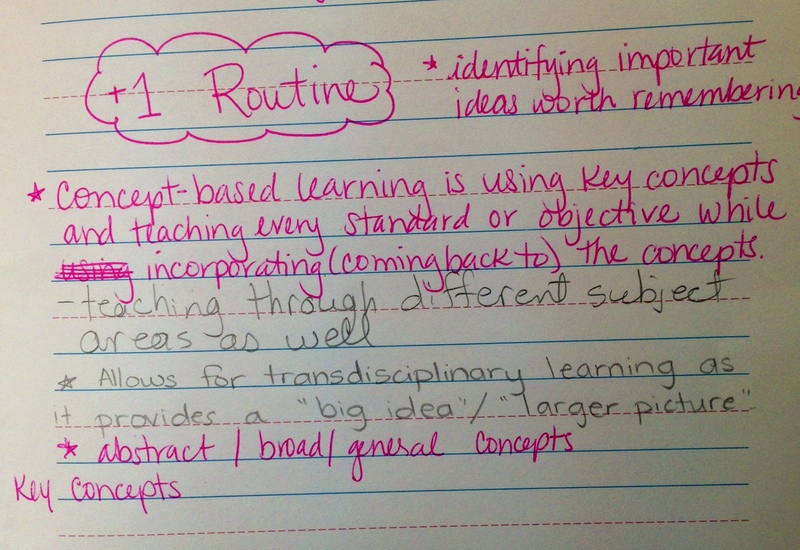 How did your understanding of these strategies grow and change? In the actual workshop, after each strategy, we took some time to discuss how the strategy could be applied/adapted to different content and different age levels. Too often when we are looking at strategies we are focused on the actual strategy within to confines of the example that is used. 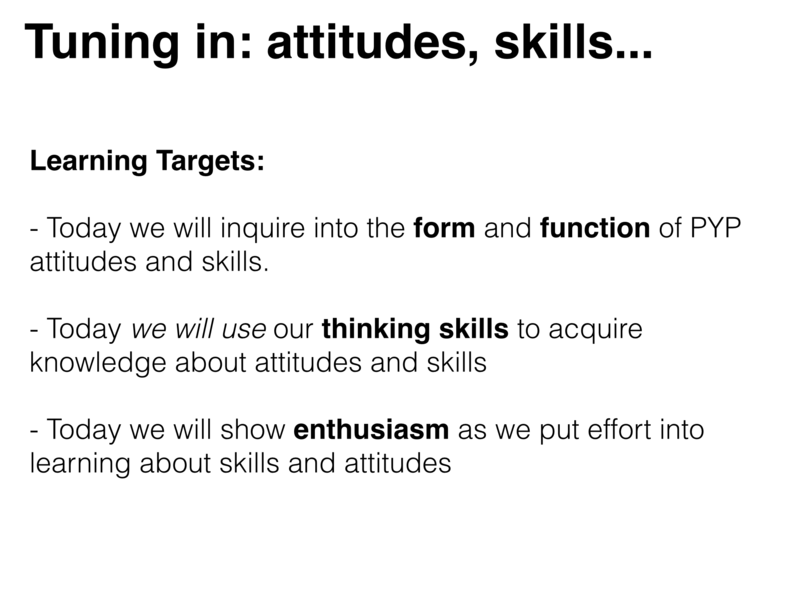 This leads to the conclusion that “That doesn’t work for the grade/content that I teach”. 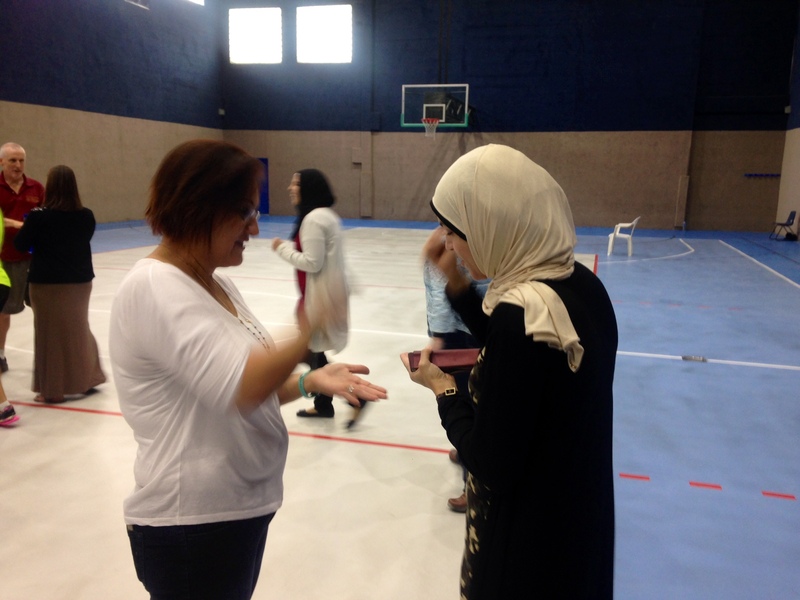 Instead, I challenged the participants in the workshop – and I challenge you in the same way – to focus on the essence of each strategy and how that same approach can be used in different ways, for different ages and for different strands of math. 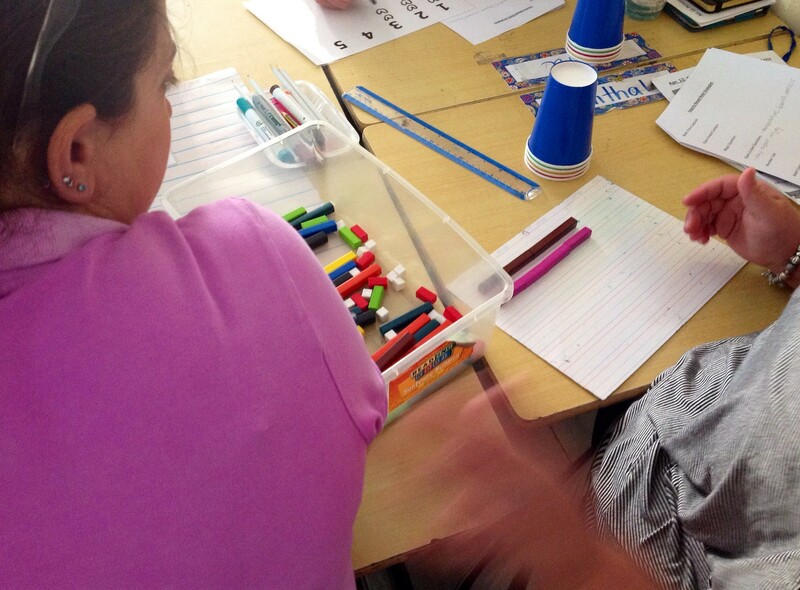 Math time capsules – In Grade 5 you might give students the summative task on the first day and then again on the last day to show all of the growth and progress they experienced. But in KG, you may conference with a student and voice/video record everything they know about shapes, and then record them again at the end of a unit to capture growth in their understanding. Magic question – In KG you might show a ten frame and ask “What do you notice?”. In Grade 2 you might show a hundreds chart and ask “What do you notice?”. In Grade 4 you might show a multiplication chart and ask “What do you notice?”. 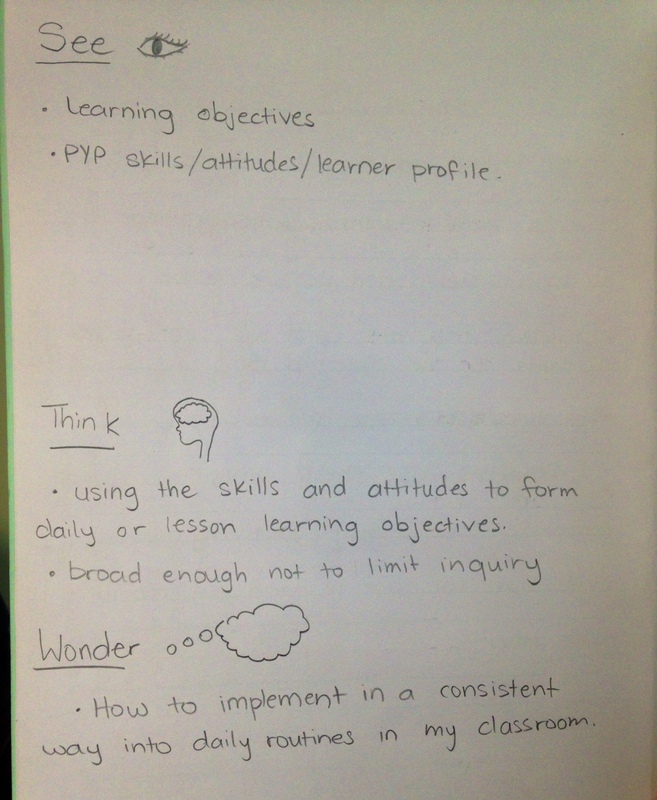 Inquiry cycle – In Grade 1 you may use the inquiry cycle to structure a whole class inquiry into measurement. What do we know about measuring objects? What do we want to know about measuring objects? How can we find out more about measuring objects? In Grade 6 you might use the inquiry cycle to structure self-directed, personal inquiries towards calculating volume of 3-d shapes. What do I already know about finding volume of 3-D shapes? What do I still need to find out? How can go about that? The possibilities are endless. If you focus on the “why” a strategy is effective and “how” a strategy helps foster thinking and exploration… then the “whats” become infinite! I also shared this google doc with some of my favourite inquiry-based math resources (books, blogs and Tweeters!) Feel free to have a look! 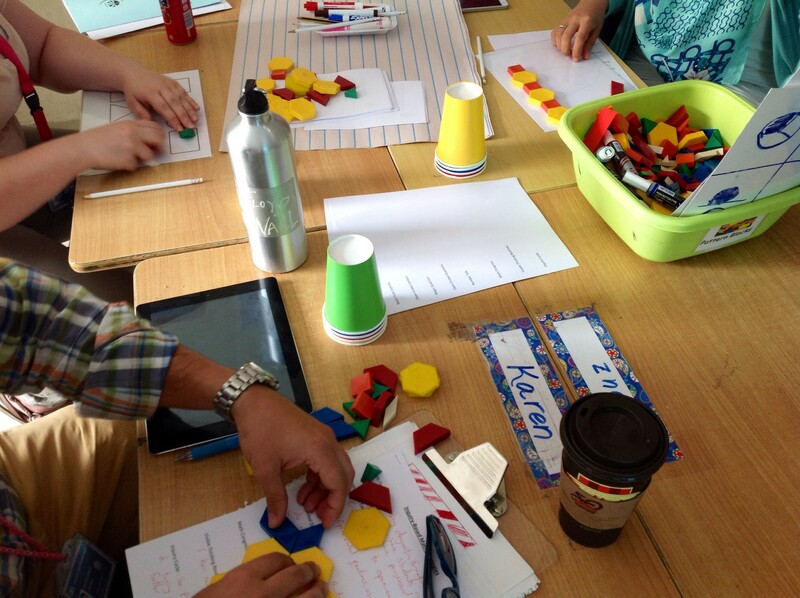 What are your favourite inquiry-based math strategies? I signed up for Twitter. Now what? So, to all the amazing risk-takers I work with, who took the plunge and joined the wonderful world of Twitter, I dedicate this post to you. I know there is often hesitation from new users to post a picture of themselves on their Twitter profile, but I can tell you that it is essential. If I’m being honest, as a Twitter user, I feel much more comfortable interacting with other Tweeters who have a profile picture and I rarely add someone who is rocking the “egg” (aka the default picture). 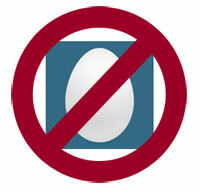 In my experience, I have never had any Twitter experiences that have made me feel unsafe or regret my choice to de-egg. Are you interested in using Twitter as a tool for your own learning or for your students’ learning? Depending on what your primary purpose is, the nature of who you follow, what you post and how you use it will all hinge on this question. If your answer is both, I recommend having two separate accounts. One for your own learning, where you can follow other teachers, post your questions about teaching and learning and share your professional successes. 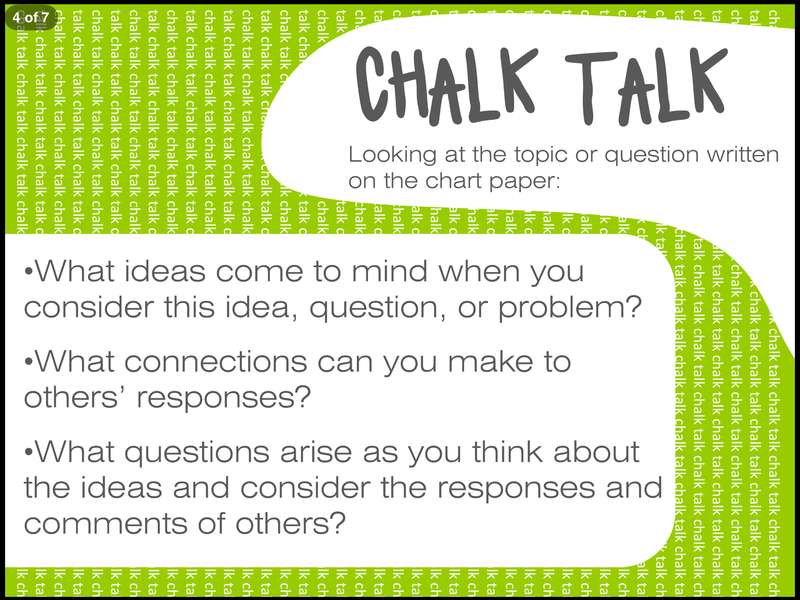 And a separate one for your class where your class can follow other classes, your students can post their questions and they can share their learning successes. When I am deciding who to follow on Twitter, I often refer to their bio to get a sense of who they are and what they might be Tweeting about. The more specific the better. If I’m going through a list and I can’t see where you teach or what you teach, I am probably not going to follow you. 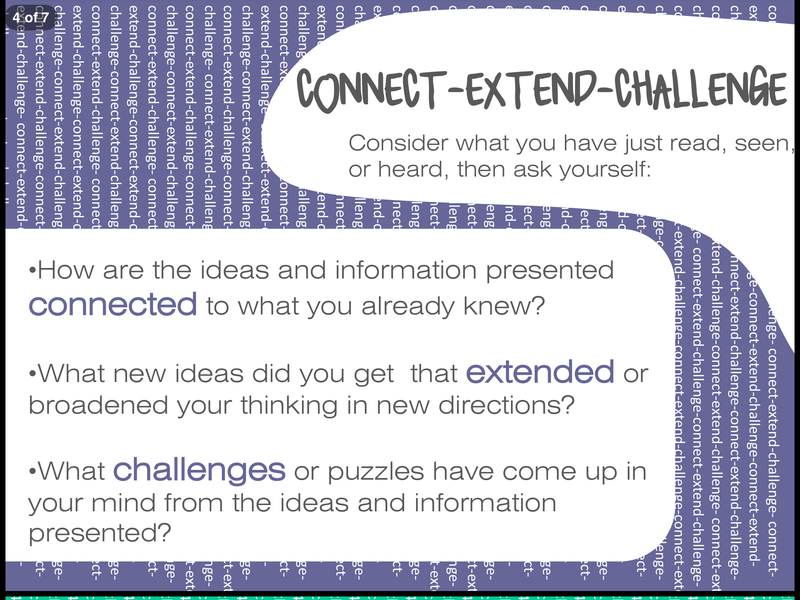 It doesn’t have to be too personal, but a few lines about your position (principal, Grade 3 teacher, PYP art teacher) and educational interests (inquiry, digital citizenship, play in the classroom) can really help you connect with other educators. The more people you follow, the more useful your Twitter becomes. And the more you tailor your list of people to your specific position and interests, the more you will get out of Twitter. 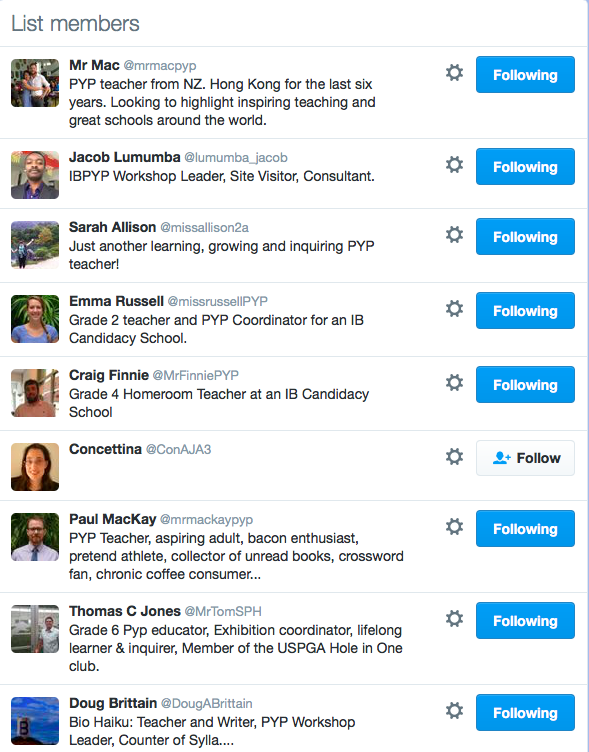 If you are using Twitter for your own learning, my advice is to start with this list of over 500 PYP educators. Scroll through, read the bios and follow anyone that you feel will be worth while. If you are using Twitter for your students’ learning then check out this list of tweeting classes, and scroll through with your students to select which classes you want to follow. Another great way to curate your list is to find someone relevant to your purpose and scroll through their list of followers. Twitter is a never-ending, bottomless pit of amazingness. There are always “New Tweets”. This is both a blessing and a curse. Trying to see everything and stay up to date is futile, especially if you are new to Twitter. 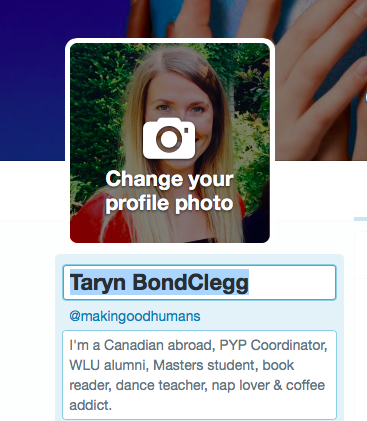 You can literally update your homepage every second and at least one new Tweet will appear. The best thing you can do it “dip in and dip out”. If you have 5 minutes to spare, open up your account and scroll through your homepage or your favourite hashtag. When your time is up log off. One of the best things about Twitter is that you can get a lot out of 5 minutes worth of browsing. One of the worst things about Twitter is that it is constantly changing and tweets get buried pretty easily as time ticks on. If you come across something you are interested in, “like” it and come back to it later when you have more time. All of your favourite Tweets are saved and can be accessed from your profile page so you can go back to them at any time. But only when you are ready. For the first little while after I joined Twitter, I didn’t post anything. So if you are at the stage where you just want to browse, explore and discover the awesome ideas and resources that are being shared by other educators- that’s perfectly fine! When you have something “Tweet-worthy” you’ll know it. 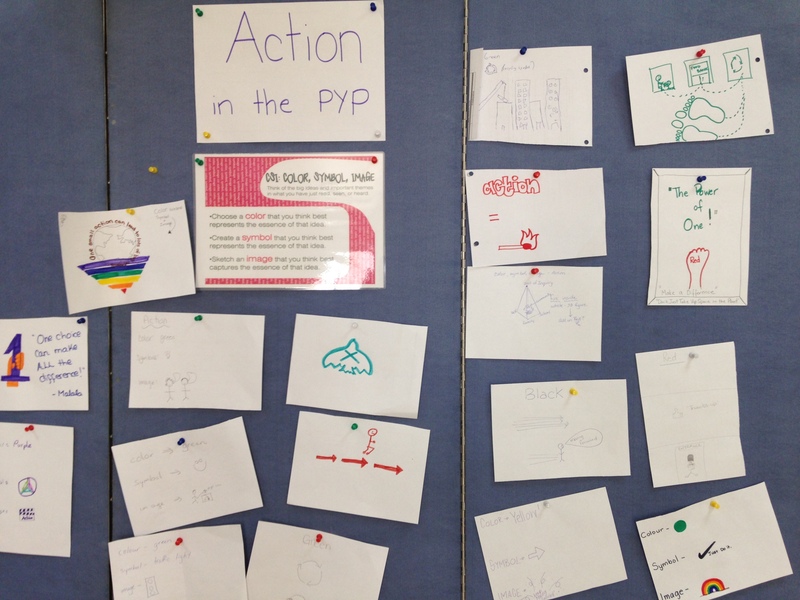 At my school we refer to this moments as the “You gotta come see this!” phone call or email that you send to your PYP coordinator when you just know amazing learning is taking place. So when you get that feeling – that you’re doing something with your students that you want everyone to know about – take a picture, log on to Twitter, click the icon of the feather and capture the magic with 140 characters or less. To help your Tweet reach more educators, choose from this list of popular education hash tags. New Twitter users – what other questions do you have? Experienced Twitter users – what other advice can you offer? The pariah of the PYP. The enemy of inquiry. But why? What could be so bad about worksheets? 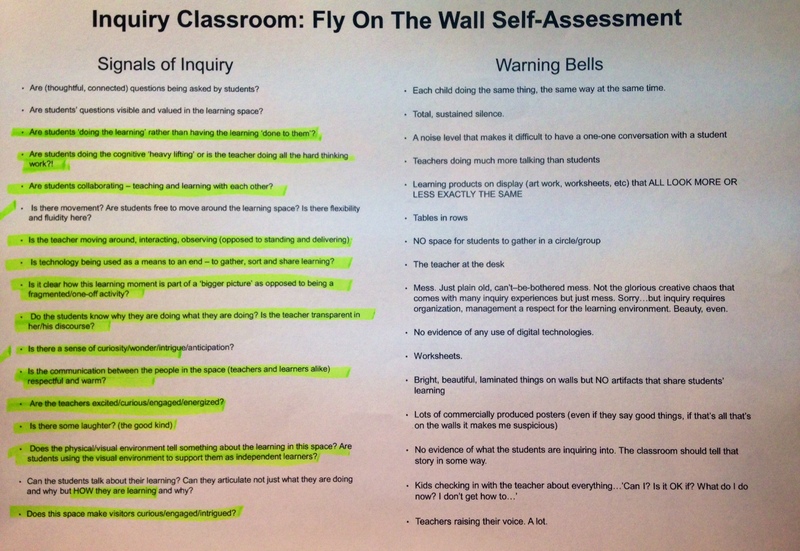 One-size-fits-hardly-anyone: For some students the worksheet will be too easy and they will fly through it. For other students the worksheet will be too difficult and they will struggle through it. Detached from student questions: Worksheets are usually selected by the teacher, based on what they want their students to learn, often before or irregardless of students’ interests and questions. 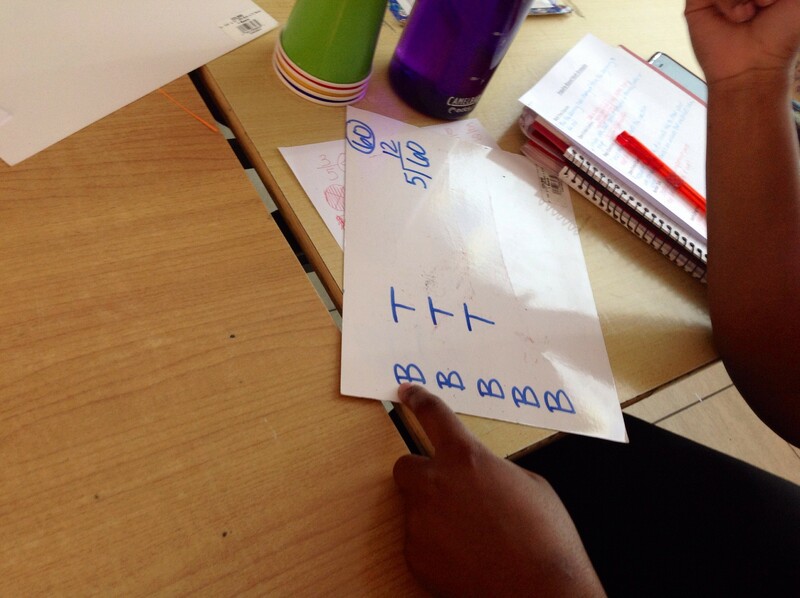 Work without learning: Students can complete a worksheet without learning anything. 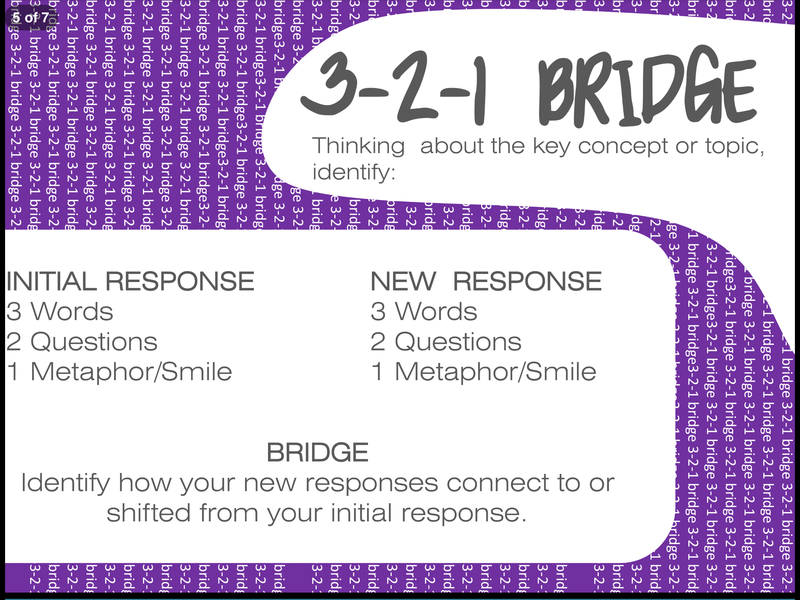 A student who already knows how to add two-digit numbers or locate a verb in a sentence can complete the 20 questions on the page without building their knowledge, gaining new understanding or challenging a misconception. 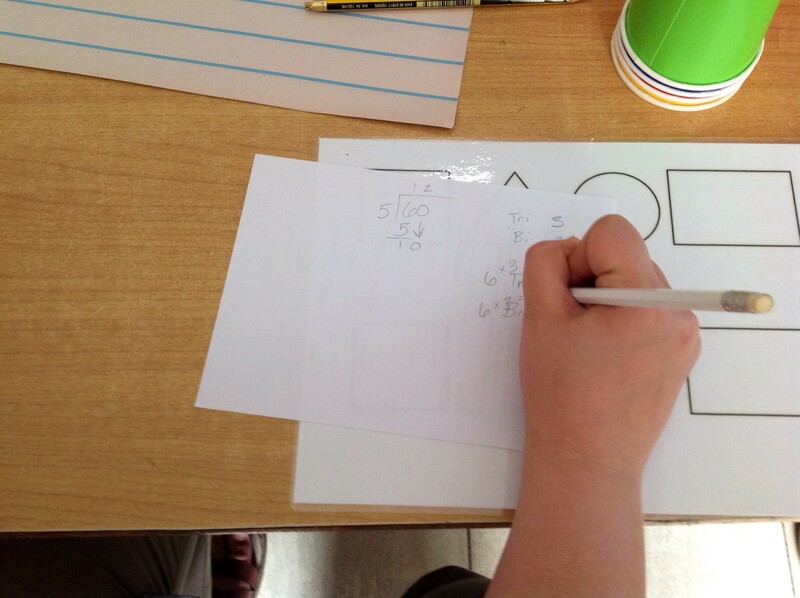 Work without thinking: Students can complete worksheets without really thinking. Many worksheets are watch and do, read and copy, fill in the blank, or find the ‘right answer’. This doesn’t leave a lot of room critical thinking or heavy cognitive lifting. School land: Worksheets force students to operate in ‘school land’, a place detached from their real life. How many toys does Adam have total? Who is Adam? Who cares how many toys this make believe person has? 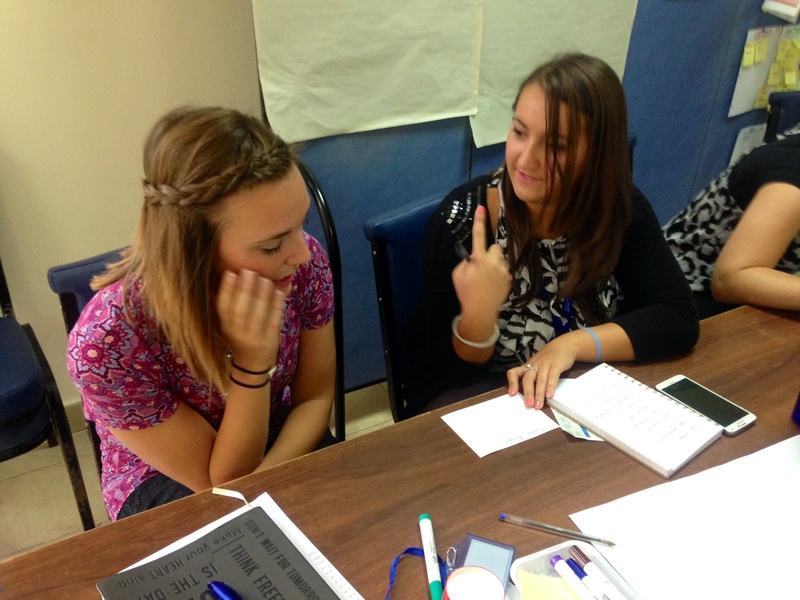 Focus on finishing: When worksheets are being used, ‘finishing’ is usually the goal. “Finish your work before recess?” “Stay in and finish your work.” “Put your work in the unfinished bin.” If a student isn’t ‘finished’ their work, maybe that is a sign that it was too difficult for them, or too easy… or just plain boring. Who cares if they don’t finish anyway? 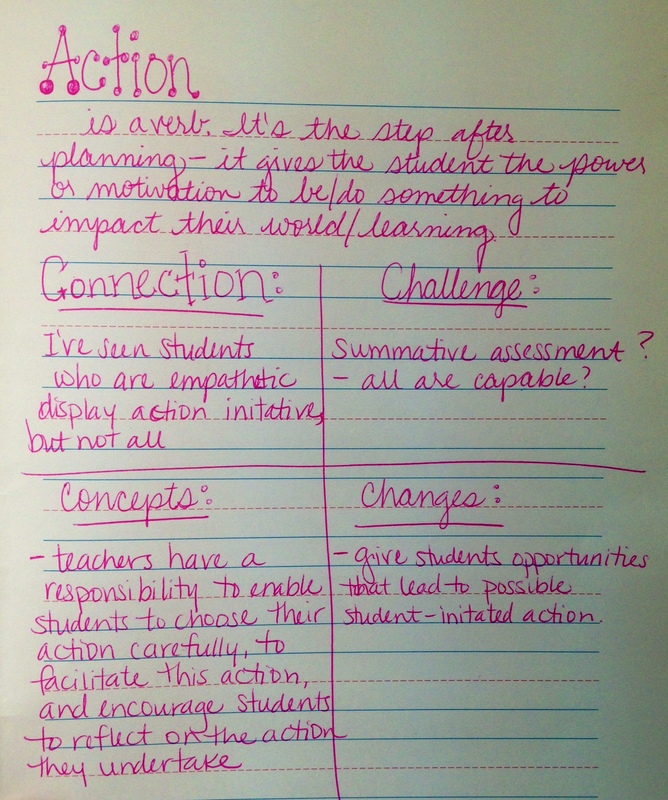 Shouldn’t our focus be on their learning and thinking, not finishing a worksheet? 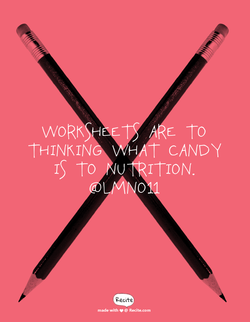 In the words of Leah Osbourne – worksheets are to thinking, what candy is to nutrition. What are your thoughts about worksheets? Warning: This is a long post! 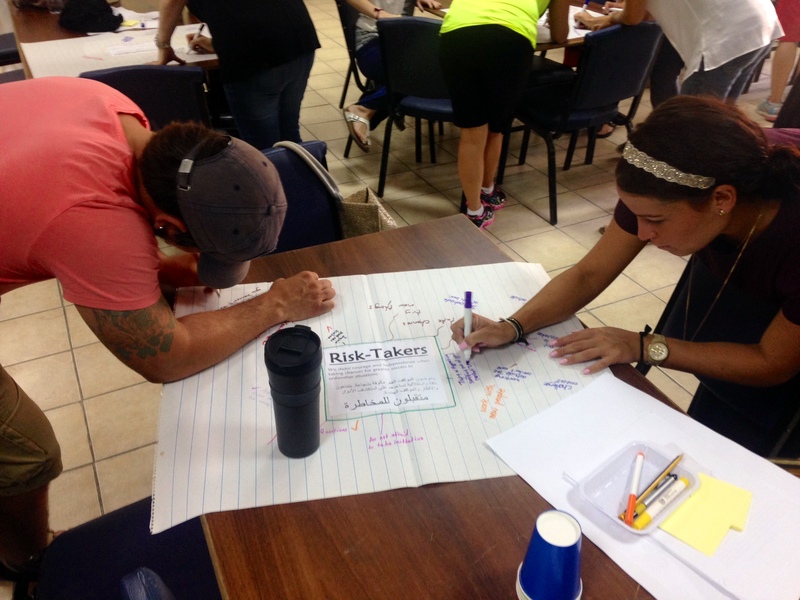 My partner and I wanted to be risk-takers and, as much as possible, run an inquiry-based orientation for our new and returning PYP staff. Here is a sneak peak into how it went. 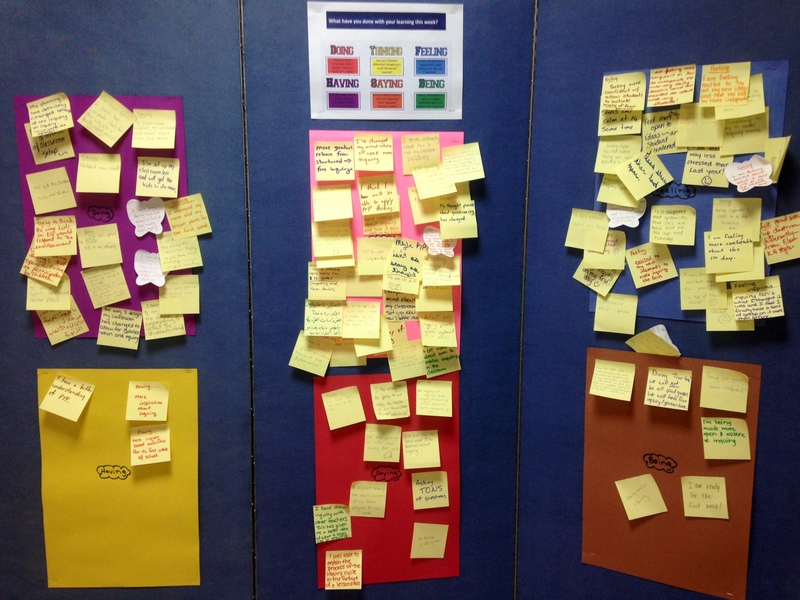 We did a Think, Write, Sort to open up a discussion around classroom set-up. 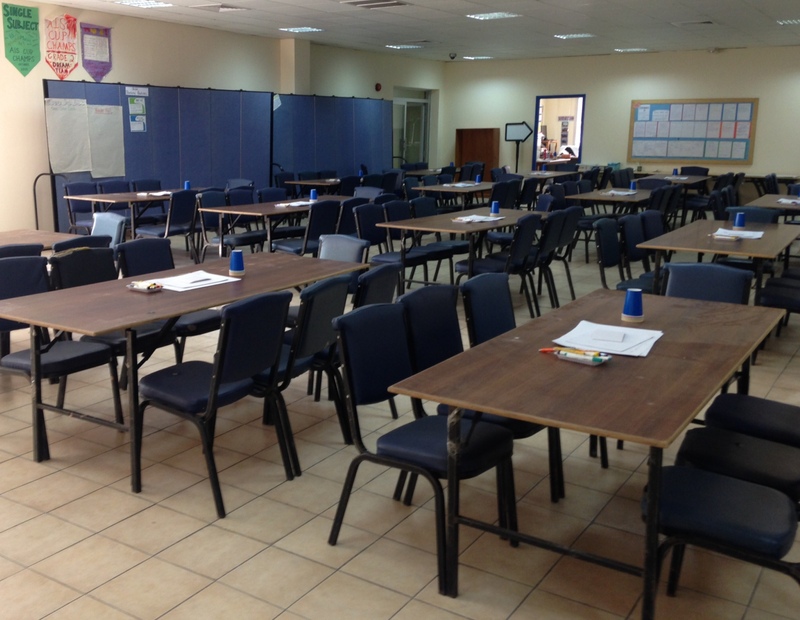 Think: What are the usual tasks of setting up a classroom? 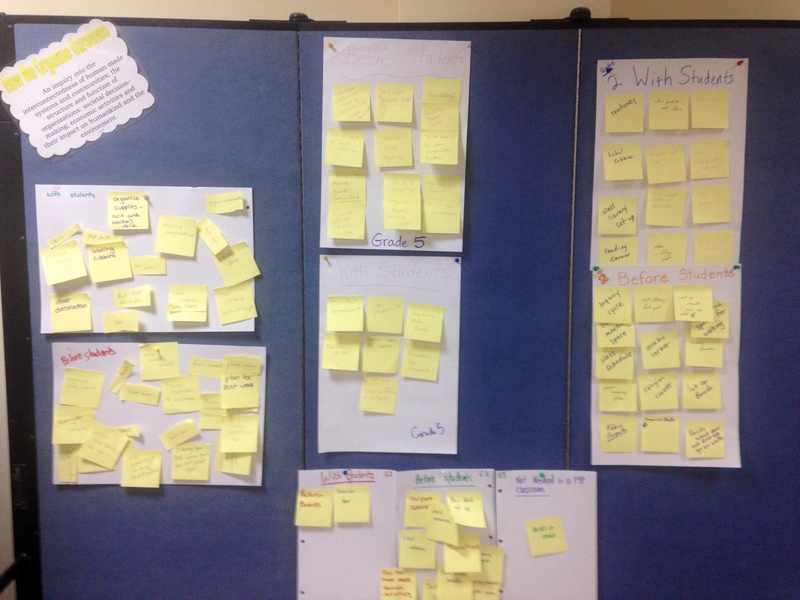 Write: Write each classroom set-up task on a separate post-it note and place it in the middle of your group. Walk: Walk around and see what other groups think. 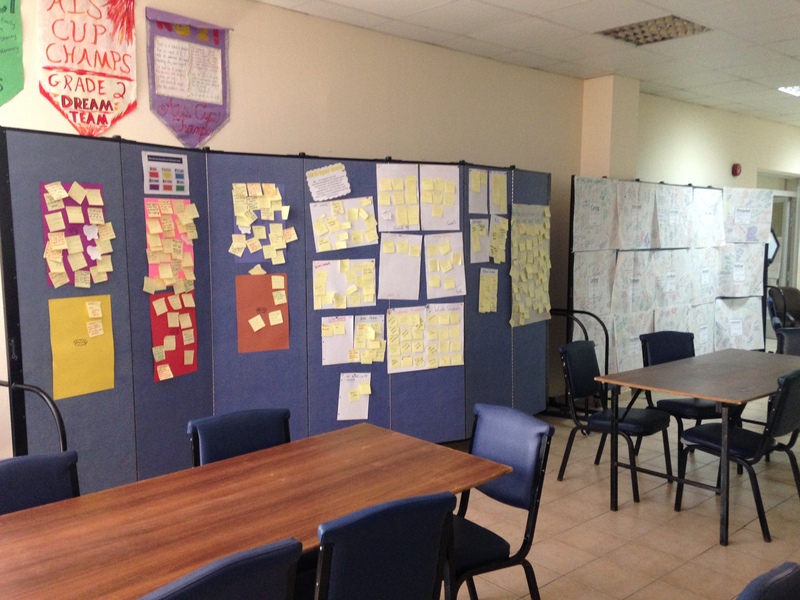 Post: Display teachers’ thinking in the learning space. 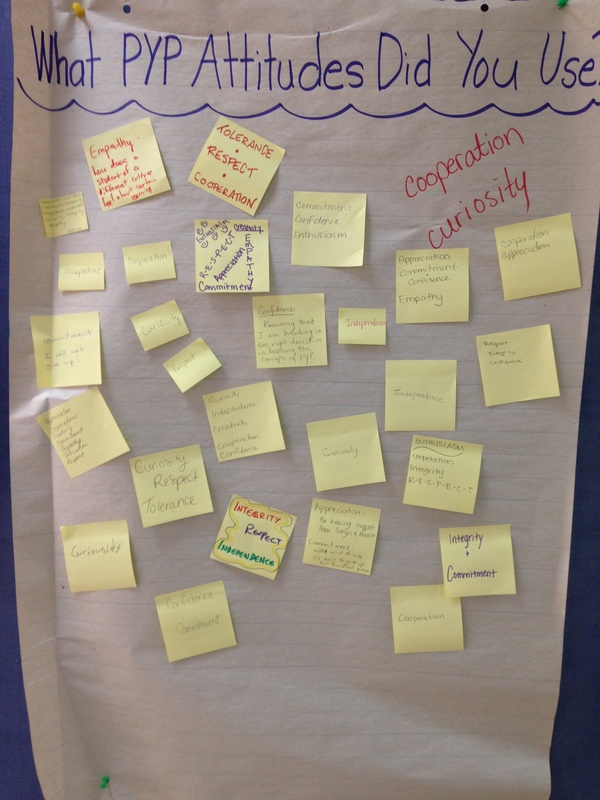 We brainstormed the ways we, as staff, demonstrate the attributes of the learner profile in our professional learning community. Then we took a break to play together. 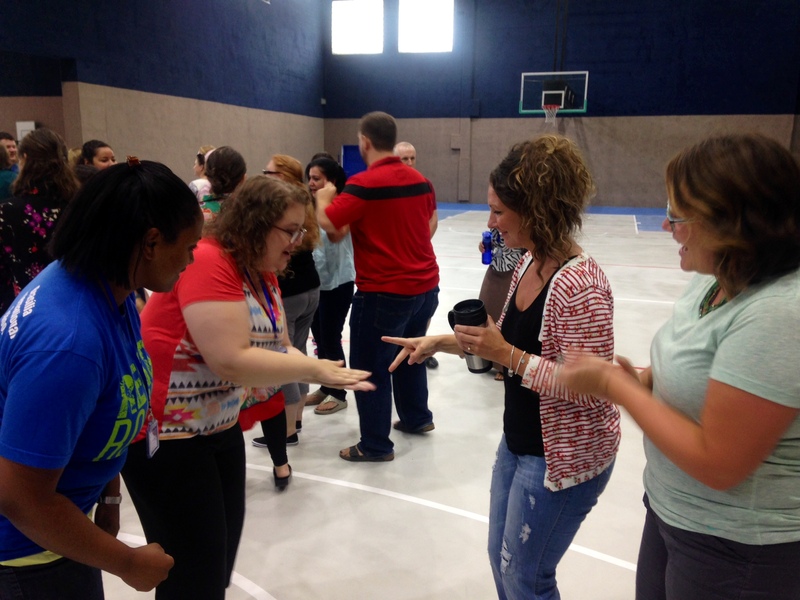 We played rock, paper, scissor entourage and it was AWESOME! 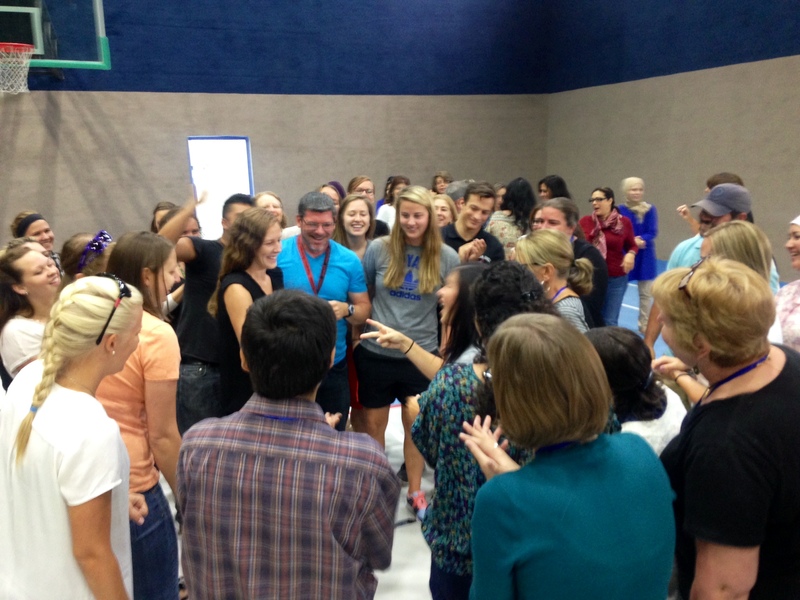 Everyone faces off against a colleague for a one-stop shot of rock, paper, scissor. The winner goes on to face another winner, and the loser becomes the winner’s entourage who then cheers on the winner! Then the loser and his or her entourage join the entourage of the winner, as the winner faces off with another winner. And do the pattern continues until there are only 2 winners left with HUGE entourages, cheering loudly! 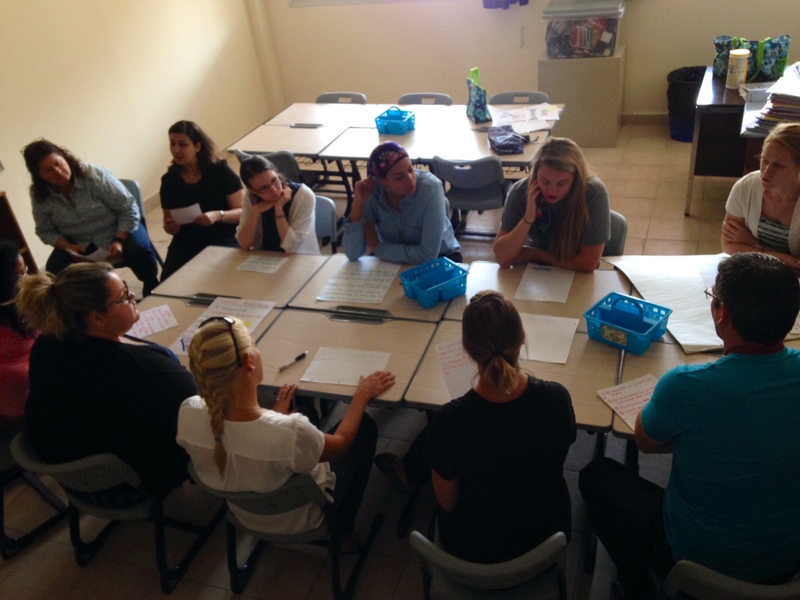 Then we got back to work learning, using a Growing Definition to draft our staff essential agreements. Now, we are ready to post our essential agreements. 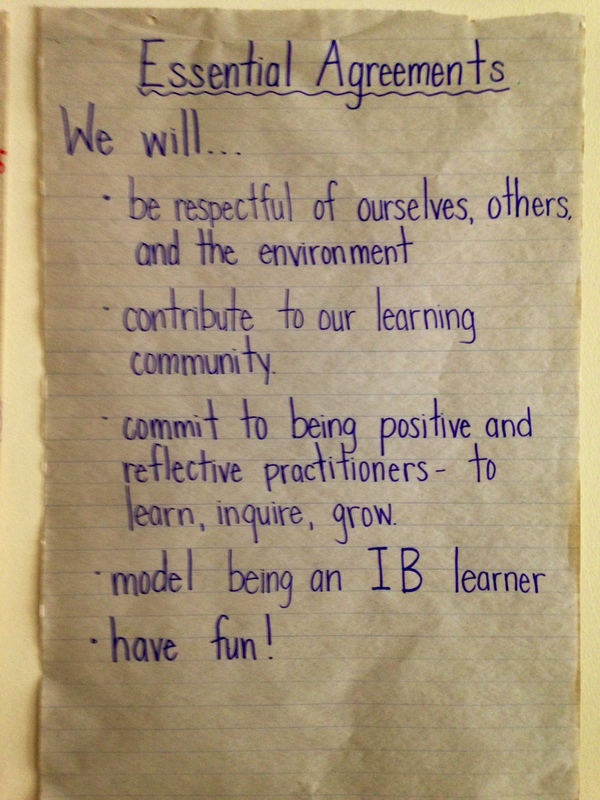 We plan to “live ’em, not laminate ’em” and continually reflect on them throughout the year as needed. Last but not least, a reflection! Not about what we learned, but instead about how we learned. 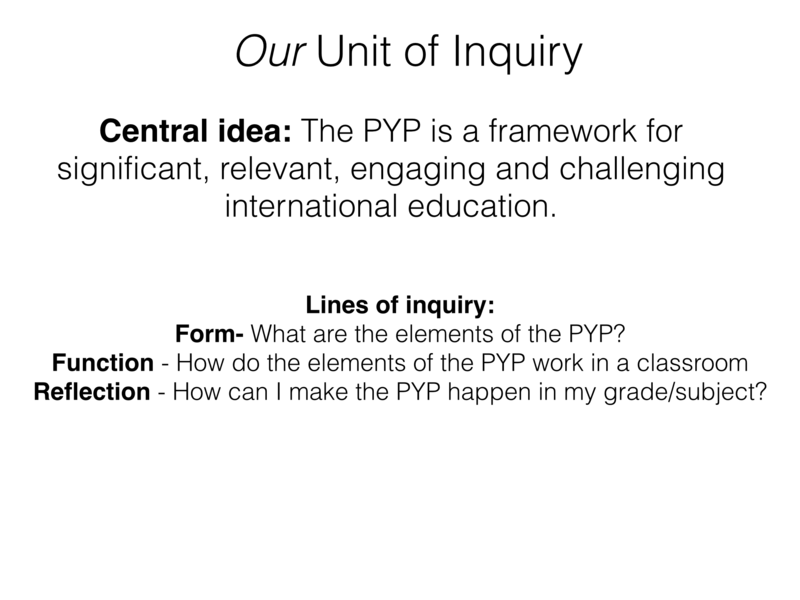 We mixed and mingled our PYP, MYP and DP teachers to learn and share about inquiry across the continuum. Inspired by this post by What Ed Said. We used the Kath Murdoch inquiry cycle and this prezi to structure our inquiry. 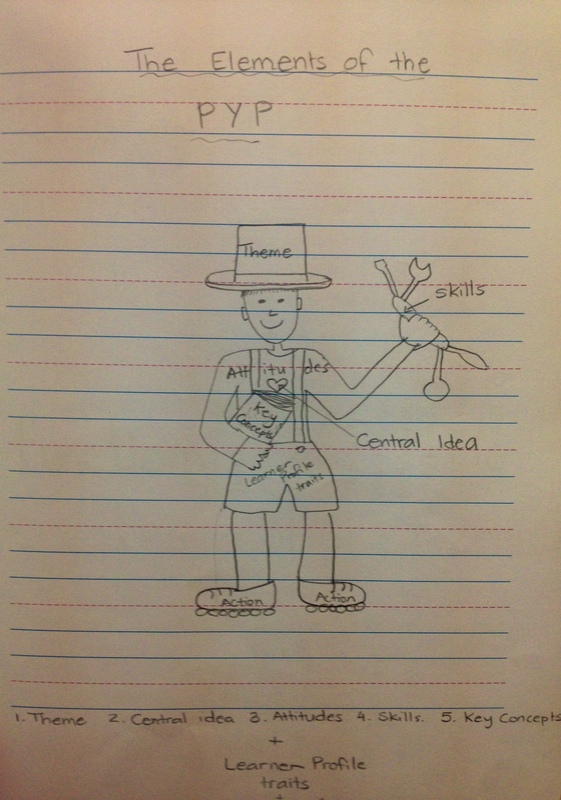 Provocation: What ideas about teacher and learning does this video portray? Tuning In: What is your experience with inquiry? 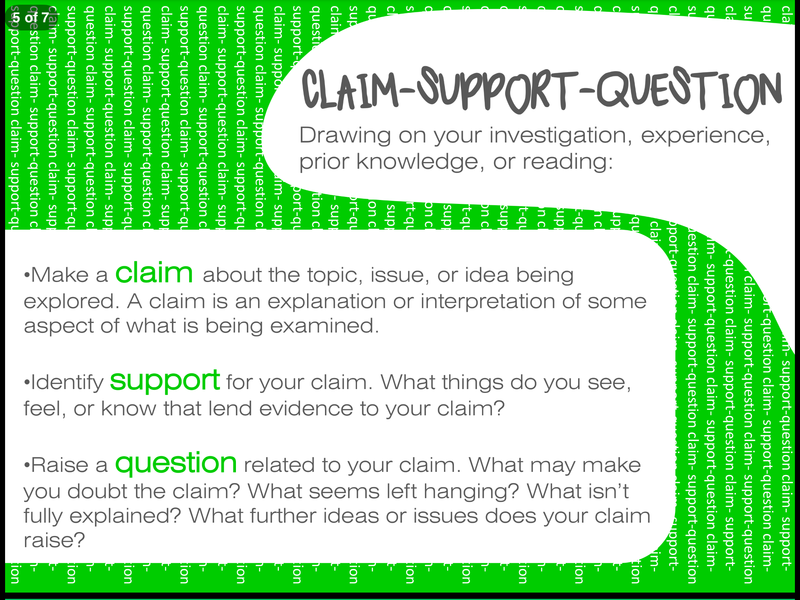 Finding Out: Based on your current understanding, what are you questions about inquiry? 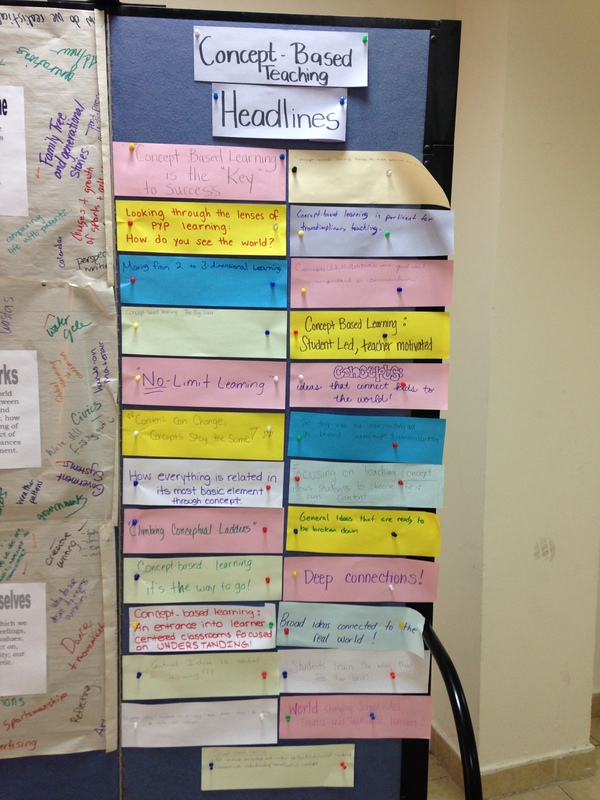 Sorting Out: Using the resources provided, self-select some blog posts, videos, twitter hashtags, pictures etc. that are relevant to your questions. 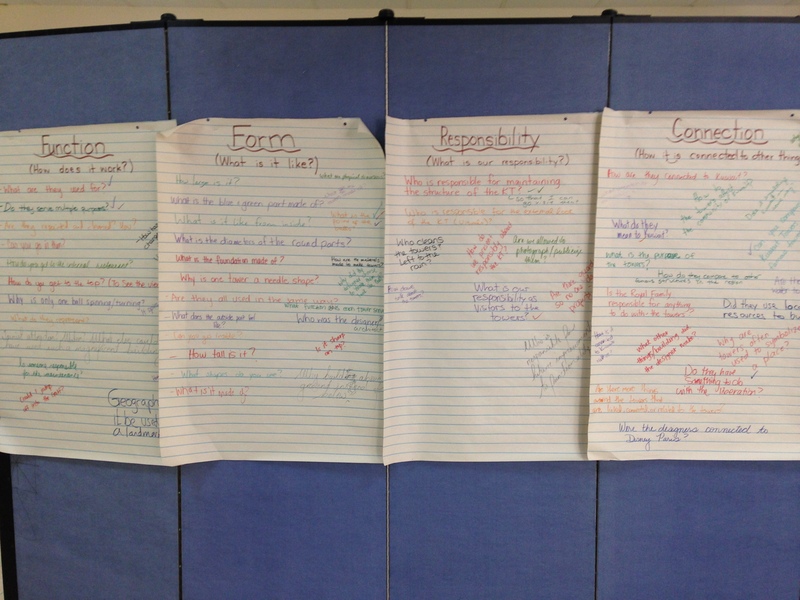 Inquiry, inquiry, inquiry… but how do I do it? 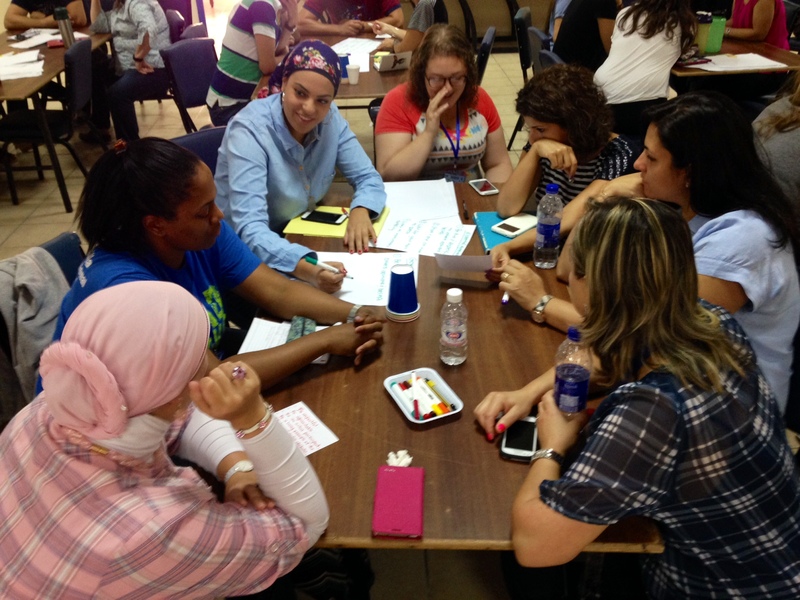 Is inquiry a struggle for you? 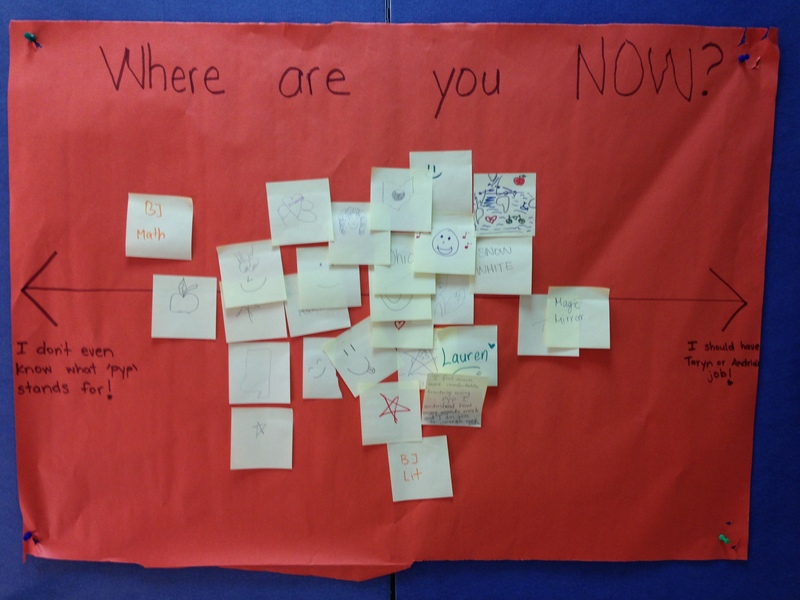 Classroom Set-up: How much should we be doing without students? 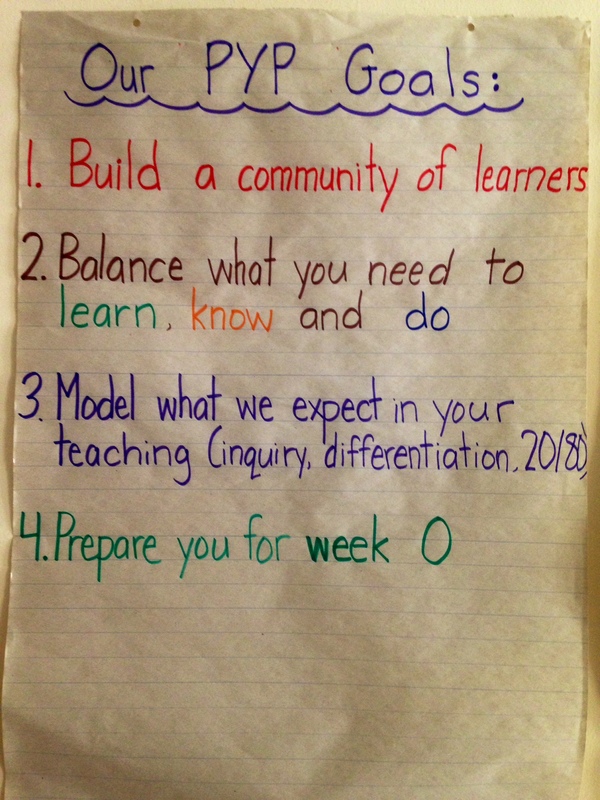 Going Further: Using what you’ve learned, create a Frayer model that demonstrates your current understanding of inquiry. 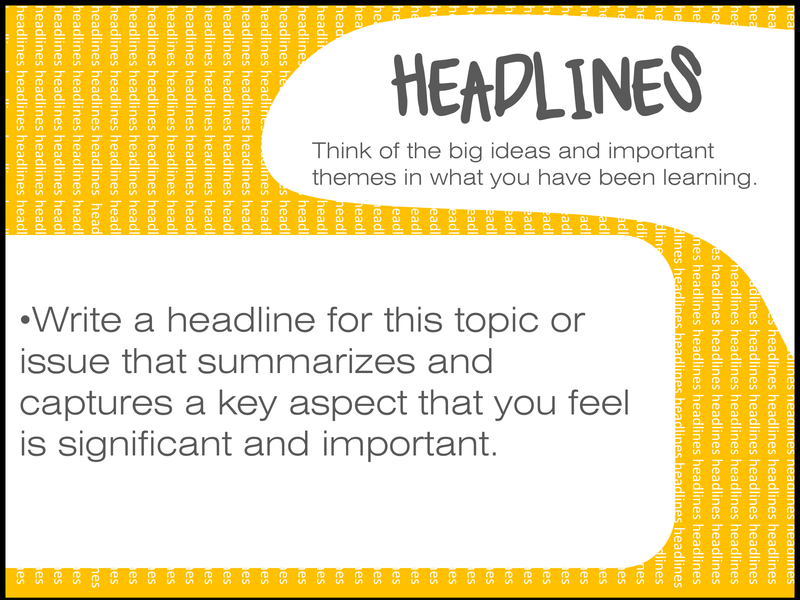 Making Conclusions: Based on what you discovered, what are you new questions? Taking Action: Now that you know what you know, what are you going to do about it? 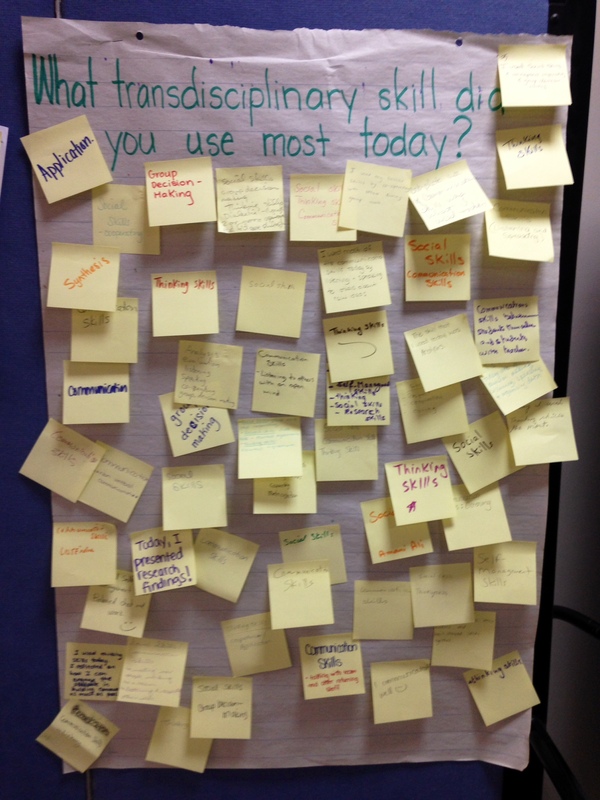 Reflection: What was it like to learn through inquiry? What did you notice about yourself as a learner? How will that impact that work you do with your students? Provocation: We used this post from What Ed Said to disrupt our comfortable thinking about what should take place the first days of school. Then we gave time to grade and subject teams to collaboratively plan their first week of school, using the following resources. What do you want to do on your first day of school? 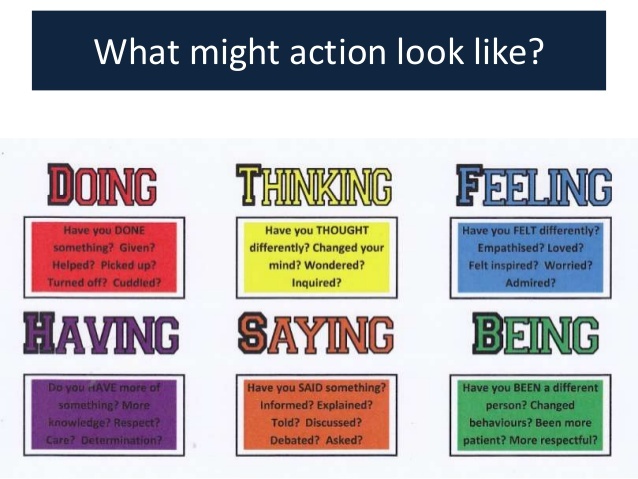 Using this visual, we encouraged teachers to think about what they learned this week, and more importantly what action they took based on their learning. 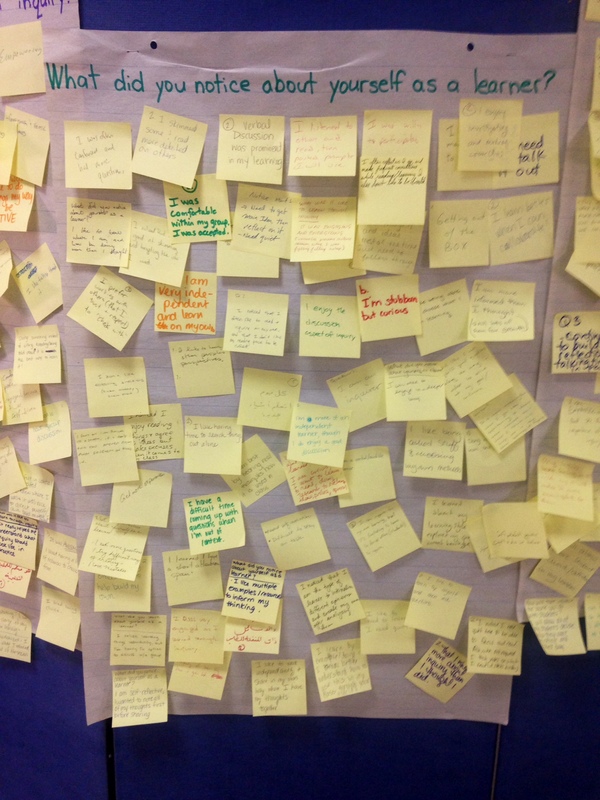 Teachers then filled in post-its with their action and posted them on our action wall. Finally, we asked for their feedback. We referred back to the 4 goals we introduced on the first day of orientation week and asked for “stars and wishes” about what we did to accomplish those goals and what may have hindered those goals. 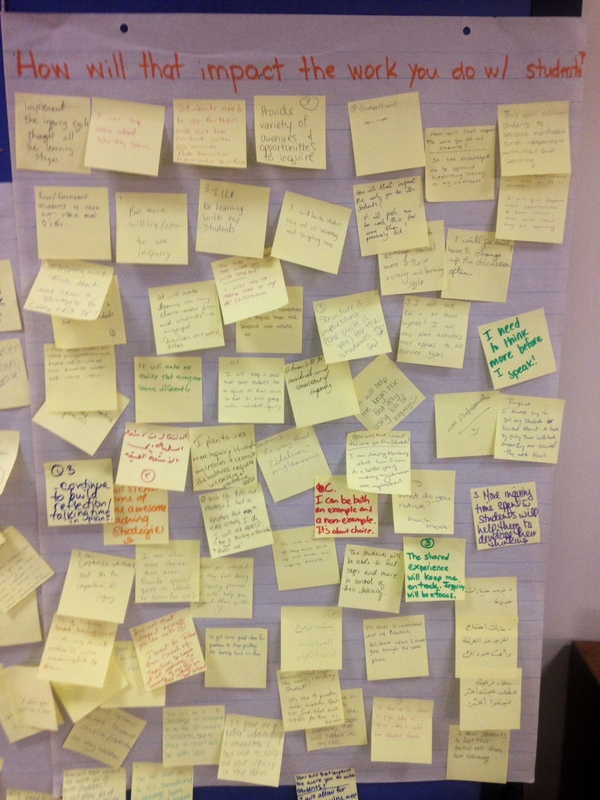 We will keep this valuable feedback to help improve our staff orientation week next year! 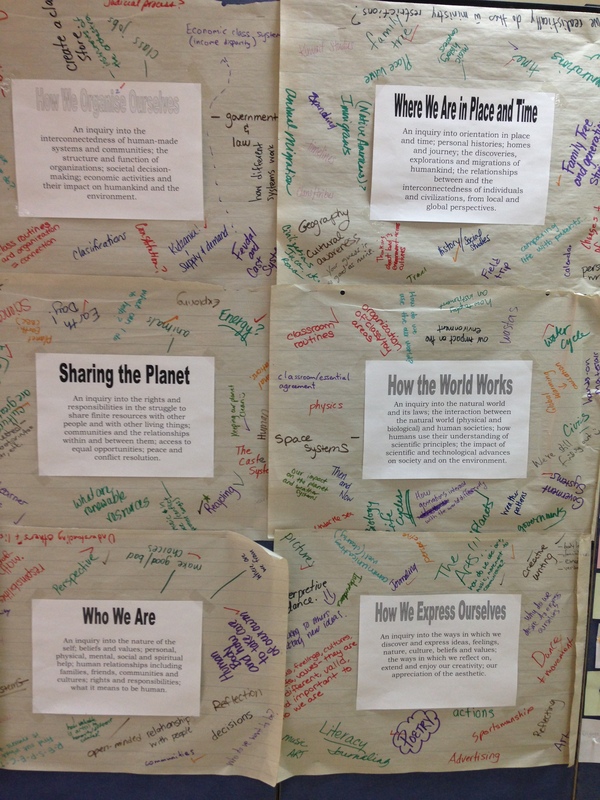 After 5 days, our empty walls were filled with resources along with our teachers’ questions, thinking and action! Now we are ready to start an amazing new school year! 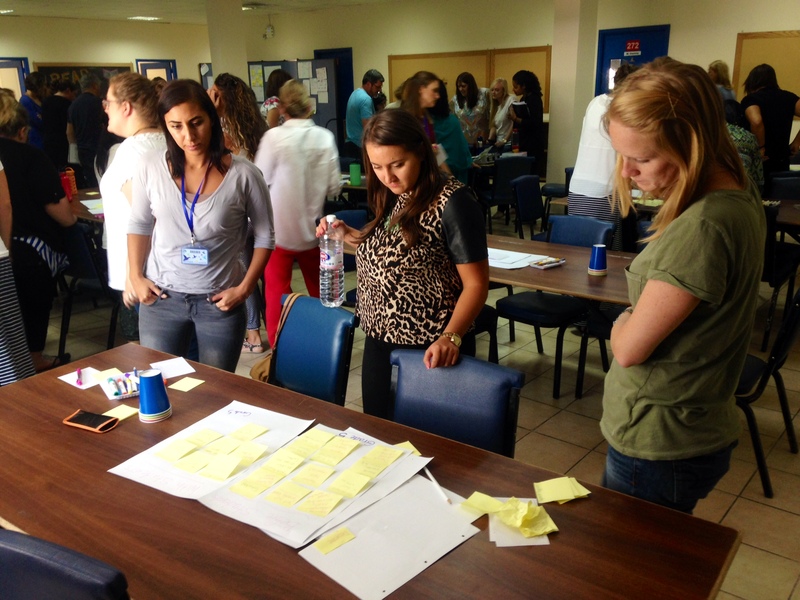 How have your teachers prepared for a new year in the PYP?